The Ardabil carpet is one of the largest and finest Islamic carpets in existence. It is also of great historical importance. It was commissioned as one of a pair by the ruler of Iran, Shah Tahmasp, for the shrine of his ancestor, Shaykh Safi al-Din, in the town of Ardabil in north-west Iran. In a small panel at one end, the date of completion is given as the year 946 in the Muslim calendar, equivalent to 1539-40. The text includes the name of the man in charge of its production, Maqsud Kashani. Design: Field: dark blue ground with yellow central medallion with 16 satellite ovals. Above and below are suspended red lamps, one larger than the other. Each corner has one quarter of a medallion; the rest of the field has a rich scattering of blossoms. Main border: blue ground with red cartouches separated by large green rosettes. Inner border: cream ground with floral meander. Outer border: red ground with double meander. Width: 530 cm non-inscription end, Width: 529.5 cm middle, Width: 535.5 cm inscription end, Length: 1032.5 cm left side looking from inscription end, Length: 1044 cm middle, Length: 1031 cm right side looking from inscription end. Purchased from Messrs. Vincent Robinson & Co. Ltd., 34 Wigmore Street, London. This very large carpet looks as if the design should be one quarter of the whole, reflected horizontally and vertically to form the complete rectangle, but the design is actually one long half, reflected across the vertical axis. The fact that some of the small ogival medallions clustered around the lower corners and around the central medallion are noticeably distorted suggests that a sketch was used for most of the design while a cartoon was used for the detailed interlocking motifs in the yellow medallion. 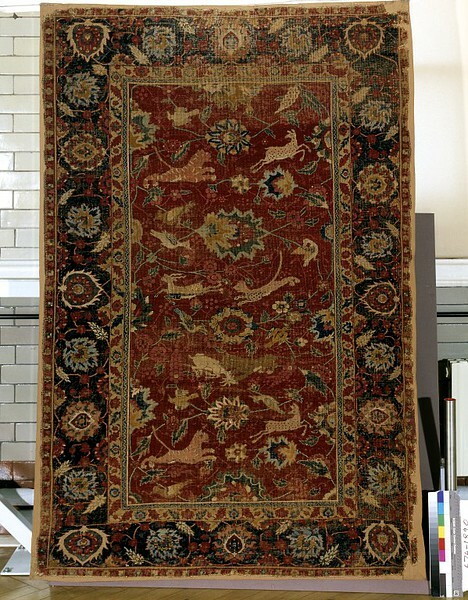 The combination of sketch and cartoon was common in 16th century Persian medallion carpets. Note the abrash, the colour difference caused by different dye batches, in the yellow of the central medallion. R. W. Ferrier (ed), The Arts of Persia, Yale University Press, New Haven & London, 1989. 334p., ill. ISBN 3-8041-801-06230-8 Ch.8, pl.4. K. Erdmann, Oriental Carpets (Sussex: The Crosby Press 1976): 32, 36, pl. 64. W. Von Bode & E. Kuhnel, Antique Rugs from the Near East (London: G. Bell 1970): 92, 94, ill. 61. A. C. Edwards, The Persian Carpet (London: Duckworth 1953): 8-11, 13. To preserve its colours, the Ardabil carpet in the centre of the gallery is lit for ten minutes on the hour and half-hour. Except for thy haven, there is no refuge for me in this world. Other than here, there is no place for my head. The first two lines are from a verse written by the 14th century poet Hafiz. It is not known who Maqsud of Kashan was but it is possible he was the designer. It is not known for certain who commissioned these carpets nor where they were woven, but the fact it would have taken about 4 years to weave the pair and this would have been reflected in the cost, suggest it was a royal commission. Medallion designs of this type are usually associated with Tabriz in north-west Persia. 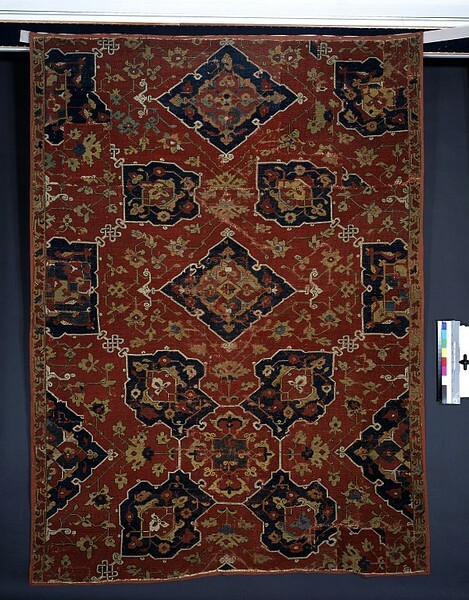 The pair to this carpet is in the Los Angeles County Museum of Art (inv.no. 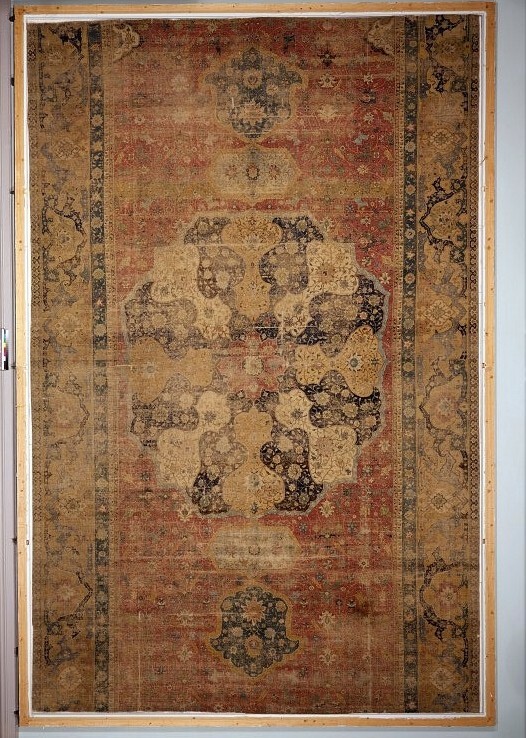 53.30.2); pieces were taken from it to repair the border of this carpet (see diagram below) before both were sold in the early 1890s. Warp: cream or undyed silk; average of 35 threads per inch. Weft: cream or undyed silk; 3 paired shoots after each row of knots. Pile: wool; asymmetrical knot; 340 knots per square inch. The main field contains two large X-shaped compositions made up of large and small medallions. They are balanced by the central device - two vases of flowers on elaborate stands, set on either side of a fish pond. Half of this central device is repeated at either end. The densely decorated field and border includes many animals, shown in repose or in combat. The history of the carpet is unknown. It is called the Chelsea carpet because it was purchased from a dealer in that part of London. 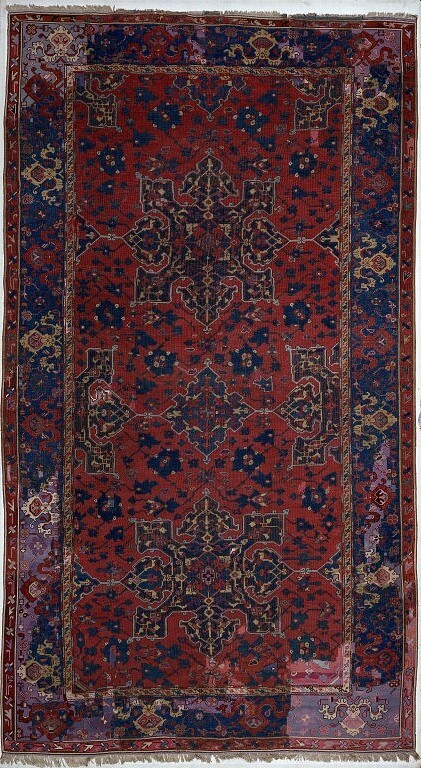 Carpet, Medallion Carpet, hand knotted woollen pile on woollen warp and weft, Persian, 16th century. Central part only, both ends are missing. T.267-1959 is one of the corner pieces. Warp: white wool; Z2S; 25 threads per inch (100 per dm). Weft: white wool; Z2S; 3 shoots after each row of knots; 14 knots per inch (56 per dm). Pile: wool; 12 colours: red, orange, dark yellow, yellow, dark green, green, light green, dark blue, blue, light blue, black, white; asymmetrical knot tied around two threads and open to the left; 175 knots per sq. inch (2800 per sq. dm). 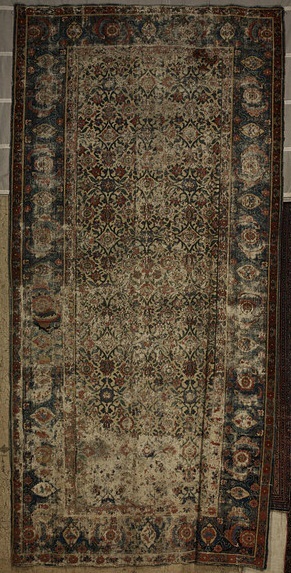 Carpet, reduced in width, hand-knotted woollen pile; Persian, 16th century. Purchased from A. Myers & Sons. 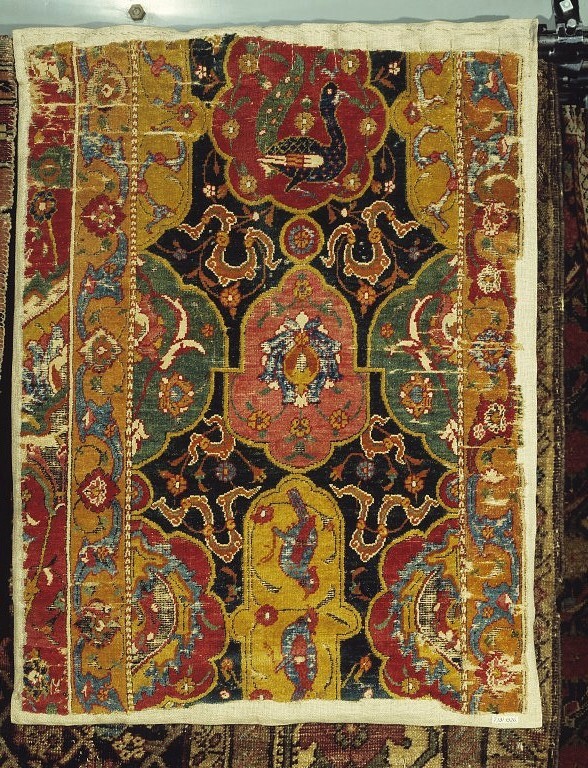 Carpet fragment, probably half of the original; hand-knotted woollen pile on silk warp and weft; Persian, 16th century. Warp: white silk, Z2S, 44 threads per inch/176 per dm; depressed. Weft: white silk; unable to ascertain spin, ply and twist; 3 shoots after each row of knots; 22 threads per inch/88 per dm. There are brocaded metal strips: one loosely wound around a white silk core, and one loosely wound around a yellow silk core; both are brocaded over groups of three warp threads. Side and End Finishes: not original; one cord oversewn with faded purple wool. Design: Dark blue ground with almost half a lobed medallion trunctated by the cut across the width of the carpet. The medallion has a brocaded groundwith green interlocking cloud bands, edged in black, green arabesques outlined in red overlaying a thin red arabesque; all with small floral motifs and the whole outlined with a dark red serrated edging outlined in green with little white buds marking the lobes. Below this is a white cartouche and pendant, to ither side of which is a large ovoid mostly contianing a large chi-lin on a pink ground.In the lower large quarter medallion of green outlined with brocaded details, there is an angel dressed in pink. On the dark blue field there is athin light blue arabesque carrying a variety of blossoms and leaves on top of which are wolves, braoced lions and grazelles being attacked by cheetahs. Main border: missing. Only one inner border remains along the lower edge; it has a dark red ground with a thin white meander containing small light blue and brocaded flowerheads and joining white blossoms bracketed by a pair of orange leaves. 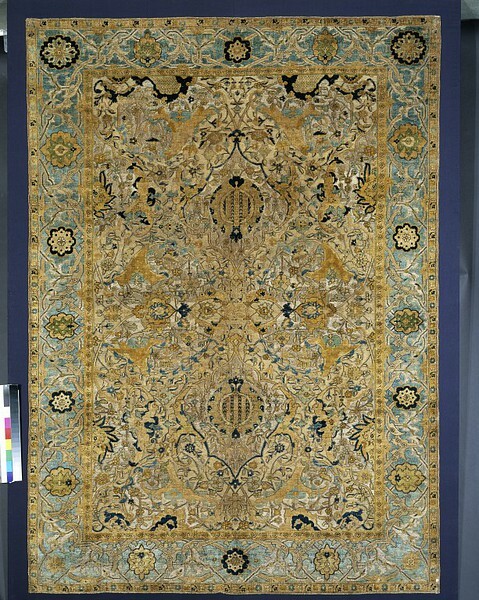 The central medallion of this large carpet has a yellow ground and broad blue interlaced stems containing small flowerheads. The interlacing encloses animals and flowers and there is a pair of birds in the centre. There are quarter medallions in the corners of the field which have a dark blue ground and contain three angels, two of which hold animals or birds. The red field is decorated with animals in combat; these include chilins, tigers, wolves, cheetahs and gazelles. There are also human faces within the larger blossoms. 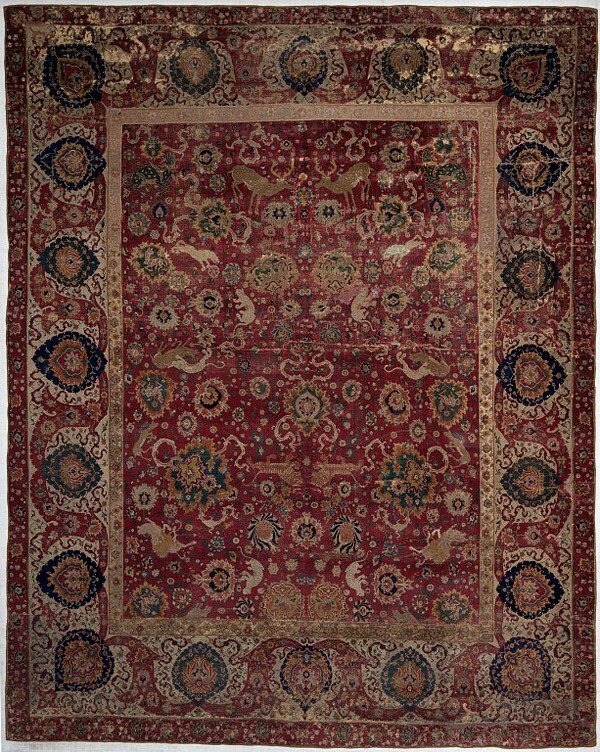 Carpet, Hunting Carpet, Sanguszko Carpet, hand knotted woollen pile on cotton warp and cotton and silk weft, Persian, 16th century. Weft: white cotton and white silk; unable to ascertain spin, ply and twist, 3 shoots after each row of knots [probably two of cotton and one of silk]; 15 knots per inch/60 per dm. Although the animals are a minor part of this design, and the ones curled in combat are barely larger than some of the blossoms yet they contain graphic details: on the upper pair, the cheetah claws are leaving bloody marks in the deer's flesh! Carpet fragment, Hunting Carpet design, hand knotted woollen pile and woollen warp and weft, Persian, 16th century. WARP: cream silk; Z2S; 26-30 threads per inch (104-120 per dm); depressed. WEFT: cream wool, light red wool and white cotton; Z-spun, unplied (wool); Z-spun, unplied 2 parallel threads per shoot (cotton); 3 shoots (wool, cotton, wool) after each row of knots; 16 knots per inch (60-68 per dm). PILE: wool; 16 colours: red, dark orange, orange, yellow, light yellow, dark green, green, light green, dark blue, blue, light blue, pink, dark brown, brown, light brown, very light brown; asymmetrical knot, open to the left and tied around 2 warps; 208-240 knots per sq.inch (3120-4080 per dm). NB: report on dyes shows: red = lac, yellow = luteolin, green = luteolin and indigo, orange = madder. 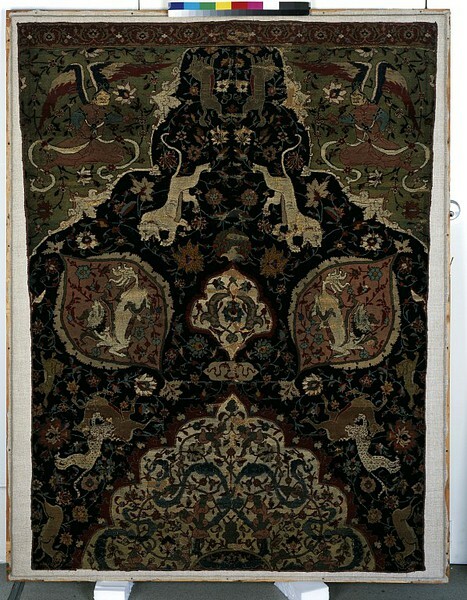 This is one of a small group of carpets of very high quality, which includes the so-called Emperor carpet in Vienna. It is remarkable both for the white ground of the border and the very lively depiction of the animals. Warp: undyed silk; Z2S; 36-38 threads per in (144-52 per dm); depressed. Weft: undyed silk; Z-spun, unplied; 2 parallel threads per shoot and 3 shoots after each row of knots; 16 knots per in (64 per dm). Pile: wool; 10 colours; red, orange, yellow, dark green, green, dark blue, light blue, purple, dark brown/black (corroded), white; asymmetrical knot open to left and tied around 2 threads; 288-304 knot per sq in (4608-4864 per sq dm). 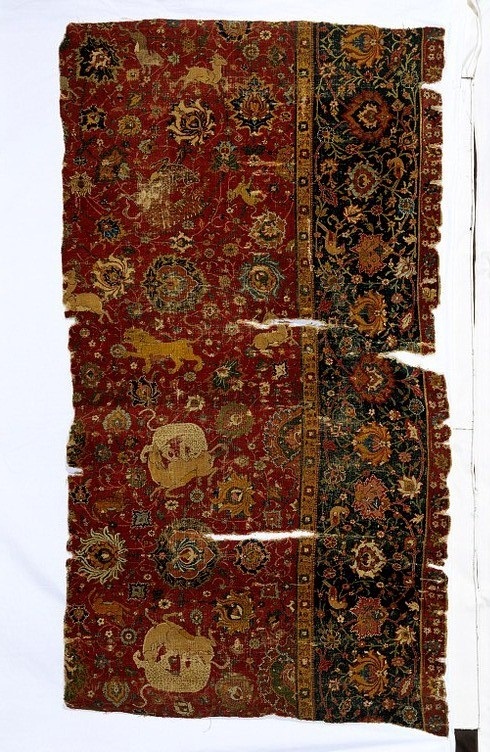 In this carpet fragment there is precise detail of things like the hairs of the lion's mane and in the tiny coloured spots on other animals, but no one element is dominant - everything is balanced against the strongly coloured ground. Fragment of the right-hand border of a Persian carpet dating to the late 16th or early 17th century. The beautiful confronting birds are not quite symmetrically positioned within their cartouche and each bird is slightly different. It indicates that the weaver was working from a sketch - the birds would have been identical if a cartoon had been used. 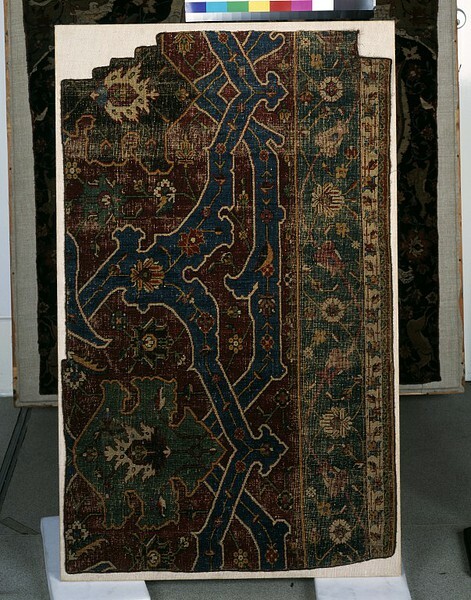 Knotted pile carpet fragment; part of the right hand border. Persian, early 17th century. WARP: yellow silk; Z4S; 32 threads per inch (124 per dm). WEFT: white cotton; Z spun, unplied*; 2 and 3 parallel threads per shoot and 3 shoots (1 of 2 parallel threads, 1 of 3 parallel threads and 1 of 2 parallel threads) after each row of knots; 14 knots per inch (54 per dm counted at 27 per 5 cm). * it is possible that these threads were originally loosely plied, but they have relaxed and now lie parallel. PILE: wool and cotton; 12 colours: red, light red, orange, light orange, yellow, dark green, green, dark blue, blue, light blue, black, white (cotton); NB: black and light blue are corroded. The red is Lac; the yellow is Luteolin and possibly Tricin; the orange is Madder and Luteolin. Asymmetrical knot open to the left and tied around 2 threads; 84 knots to the sq. inch (3348 per sq. dm). This type of carpet is known as a ‘Polonaise carpet’ even though it was made in Iran. 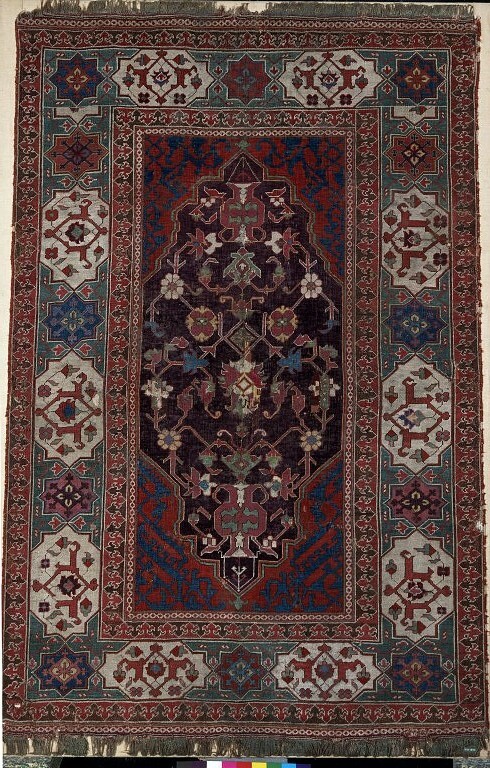 The design of this fragment is nearly identical to that of a huge carpet donated to the shrine at Najaf in Iraq, probably by Shah Abbas the Great. The misleading name arose because carpets of this type came to Europe in the early 17th century through trade or as royal gifts. Many were found in Poland and were later mistaken for Polish products. This gave rise to the term ‘Polonaise carpet’. Large areas of this field are woven with metal thread so the silk pile stands out, both physically and visually, against the glittering background. 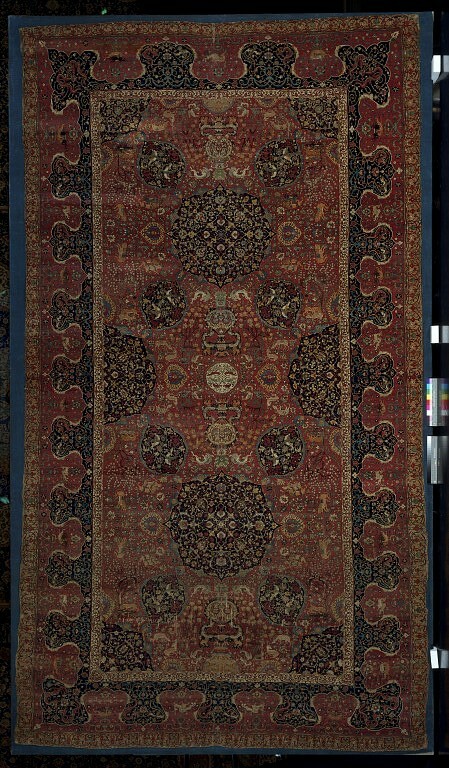 Carpets like this were highly esteemed in Europe and many of the surviving examples were originally diplomatic gifts to European monarchs and ambassadors. This is a spectacular example of the art made for a Christian community living under Muslim rule in the Middle East. 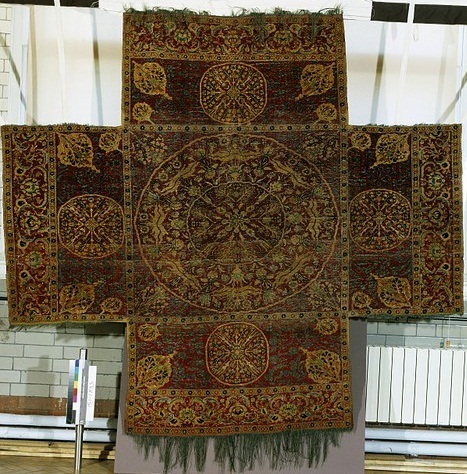 Known as a shurjar, it may have been made for an Armenian church in Isfahan, which had a large Armenian population. Armenian priests wore this vestment to celebrate Mass. Its semi-circular form is similar to the western cope. The Crucifixion would have been at the priest’s back, and the figures of Mary and the Archangel Gabriel formed an Annunciation scene on his chest. 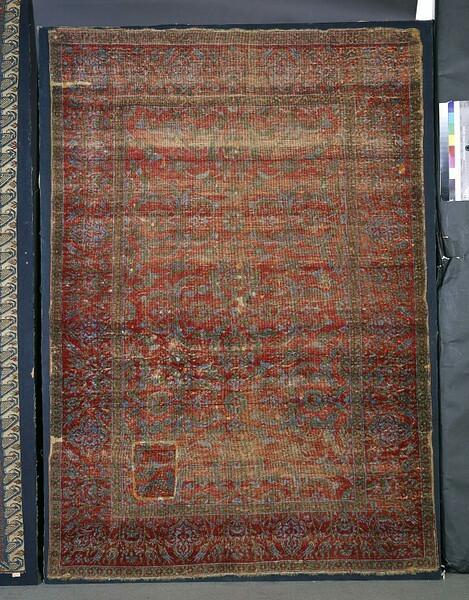 This shurjar was woven as a carpet with a very fine silk pile. It is now fragmentary as a previous owner began to cut it up, probably to provide carpet samples. 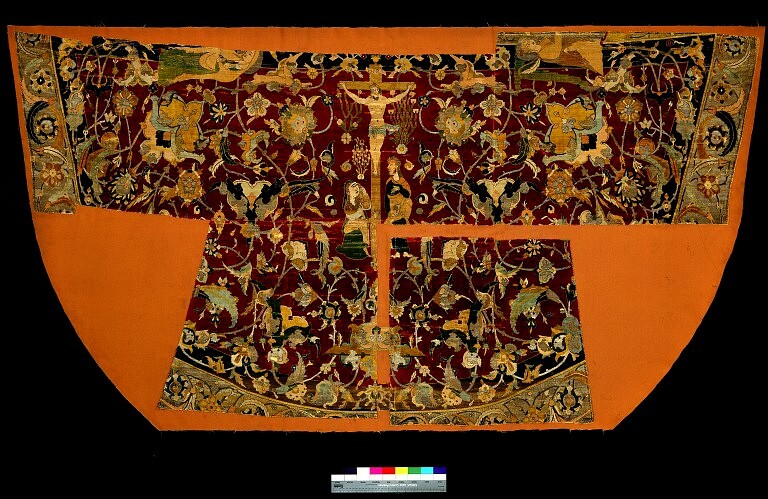 A priest's cope, made from knotted silk with floral and figurative designs executed in ochre, pink, green, deep blue, pale blue, and white, on a rich red ground. 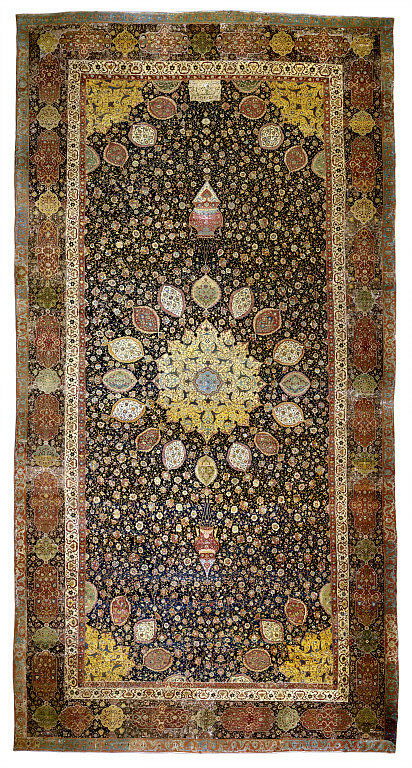 The entire surface is covered with Iranian scrollwork motifs, of blooming flowers and leaves. Within this pattern are figurative scenes of the Crucifxion and the Annunciation to Mary. The cope bears two Annunciation scenes, one at either side of the opening at the front of the cope. On the back, and, at the centre, the cope bears a depiction of the Crucifixion. The carpet designer can simplify the creative process for himself, but still create something dramatic, by using a system of overlapping 'S's on which he can draw leaves and flowers. This type of structure forms the basis of lively and exuberant designs which repeat regularly but lack the rigidity and formality of designs based on lattices. Scrolling white stems form the basis of this carpet design but the greater the skill of the designer, the more difficult it will be for you to analyse the design into its basic components. 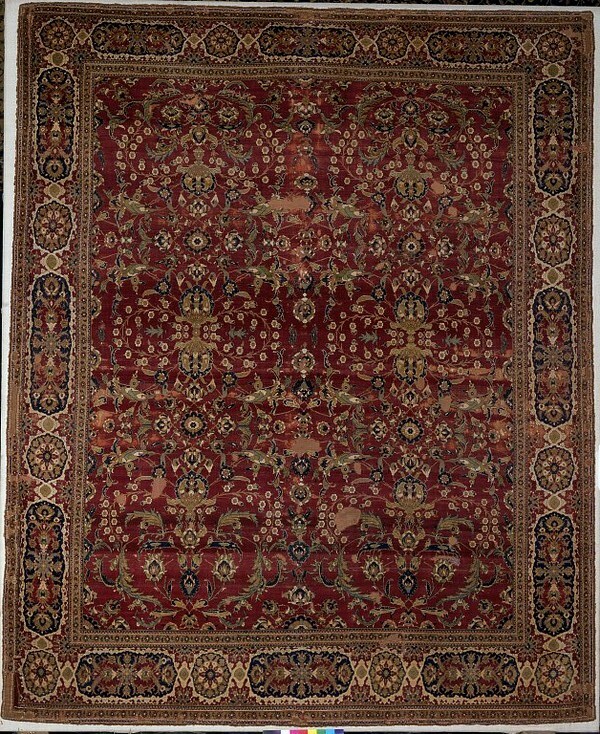 Carpet, hand knotted woollen pile on silk warp and cotton weft, Persian, 17th century. esign: Field: dark red ground with two rows of thin white spiralling stems on which perch birds and hand composite blossoms and over which there are large cloud bands (brocaded). Beneath the white spirals is a tangle of narrow dark green stems with small blossoms, rosettes and buds. There is a central line of composite palmette-like blossoms and two and two half lines of smaller versions on the horizontal axis. NOTE: two long-tailed birds in the upper half were originally woven with detailed markings - stripes or checks? Main border: very dark green ground with a dark red stem forming a meander with large palmettes and blossoms. A green stem links smaller blossoms with additional spirals with small blossoms, buds and leaves. Inner border: very light green ground with red meander and orange diagonal leaves and red, white or blue flowers and a fine black line forming a double meander. Outer border: dark red ground with a double meander with a dark green stem and light red stem. The latter bears green or dark yellow/blue blossoms and the dark green stem has a sprig of 3 small white flowers. Warp: white silk, yellow in places; Z2S; 34-39 threads per inch (136-160 per dm); depressed. Weft: Foundation: white cotton; Z2S = middle, sinuous shoot, Z-spun, unplied, 2 parallel threads - first and third, straight, shoots; 3 shoots after each row of knots; 15 knots per inch (60 per dm). Brocading: 2 types of metal thread. Both are silverstrip around a cream silk core but one appears to have been more tightly wrapped. This may have been accidental as it changes in mid-motif and does not appear to have been a deliberate design ploy. The brocading is over three warp threads and under one; on the return row it goes under the middle of the three in the previous row. Pile: wool and cotton; 15 colours: dark red, red, light red, orange, dark yellow, yellow, very dark green, dark green, green, light green, very light green, blue, light blue, black, white (cotton); assymetrical knot open to the left and tied around two threads; 255-292 knots per sq. inch (4080-4800 per sq. dm). Side finish: one cord oversewn with red silk. Green silk braid has been added later. This is a corner fragment from the very large Persian carpet (museum Number 326-1894) which the Museum acquired in 1894. The corner fragment was in the collection of Joseph McMullan and when he recognised that it belonged to the large piece already in the V&A, he donated to the Collection. Design: Field: Dark pink ground; the mirrored pairs of large decorated blossoms and smaller flowers lie on pairs of stems that meet vertically and then open into an elongated hexagon before reassembling. The paired stems are in white, dark blue and dark green (blue at bottom). Formal flowering plants fill the space, and upper centre is the vase, blue, outlined in white and sitting on the dark blue stems. Main border: A curving and arching double meander in light blue (but v. light green along lower border and lower sides) intertwines with a pink stem, both bearing the same horned purple and yellow blossom on a dark blue ground. Inner border: white ground, double meander - a green stem with yellow 5 petalled yellow/orange flowers and a dark blue stem outlined in red bearing blue buds. Outer border: light blue ground, a red meander bearing yellow 5-petalled flowers and red leaves. Warp: white cotton, Z4S, depressed. 32 per inch. Weft: white sinuous silk and white cotton (presumed - colour not visible) pulled straight. Pile: wool, 18 colours: red, orange, dark yellow, yellow, dark green, green, very light green, dark blue, blue, light blue, very light blue, dark purple, purple, dark pink, pink, light pink, dark brown, white. Asymmetrical, open to the left, tied round 2 warp threads. This carpet is one of a group in which the motifs are organised in a lattice pattern on several levels. They are sometimes called ‘vase carpets’ as vases often feature in the designs. The carpets also have a distinctive weave of cotton, silk and wool. They reflect the style that developed during the reign of the Safavid dynasty in Iran (1501-1722), which typically featured symmetrical scrollwork designs set with fantastic blossoms. This particular example belonged to the British designer William Morris (1834-1896), who used it as a source for his own work. Warp: cotton; Z 3/4S; depressed; 34 knots to the inch, 136 per dm. Weft: white; cotton with possible silk; Z-spun; unplied, 2 parallel threads; 16 rows of knots per inch (64 per dm); 3 shoots after each row of knots. Pile: wool; 14 colours: red, orange, yellow, dark green, light green, dark blue, blue, light blue, purple, pink, light pink, dark grey, dark brown, white; asymmetrical knot open to left tied around 2 warp threads. WARP: white cotton; Z4S; 33 threads to the inch (130 per dm); depressed. WEFT: pale green wool; Z2S; 3 shoots after each row of knots, 1 straight, 1 sinuous, 1 straight; 12 knots to the inch (50 per dm). PILE: wool; 19 colours: red, orange, dark yellow, yellow, very dark green, dark green, light green (two shades, one replaces the other), dark blue, blue, light blue, purple, dark pink, pink, dark brown, brown, light brown, black, white; asymmetrical knot open to the left and tied around 2 warps; 198 knots to the sq. inch (3250 per sq. dm). SIDE FINISH: one cord oversewn with dark pink wool. The carpet designer can simplify the creative process for himself, but still create something dramatic, by using a lattice to form a network of spaces. He can decorate both the lines and the medallions they enclose by drawing different motifs in each compartment. If he is cunning he can make the structure less obvious by using two or three lattices of different size, superimposed slightly off-set, as in this fragment. 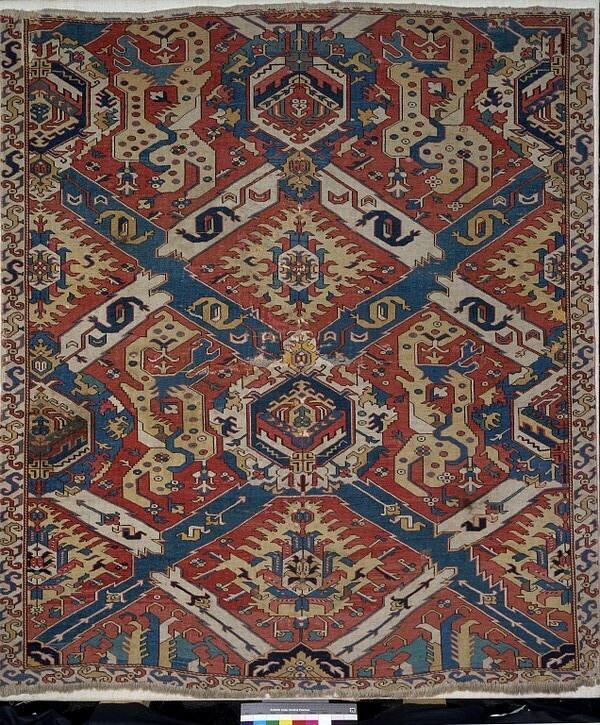 A minor border with a white ground and orange, blue and light blue meandering stems starts with a right angle part of the way up the right hand side; this suggests that the borders did not form parallel lines along the sides of a rectangular carpet and that this carpet might have been an unusual shape. Note also the blue vase in the lower right hand corner. This is a fragment of the right-hand side and border of a Persian carpet. It is seldom that attention is given to the borders which frame the more dramatic part of a carpet, but care also goes into their design and colouring. Notice how the power of three broad, interlacing meanders has been softened by the addition of narrow floral stems and that the light ground inner border has been woven on a slightly smaller scale than the darker outer border. Put these three elements together and they create a subtle and harmonious barrier around the field. There was a blue and white vase in the lower part of this fragment, but most of it is now missing. WARP: white cotton; Z4S; 30-34 threads to the inch (122 per dm); depressed. WEFT: white cotton; Z3S; unable to ascertain exact number of shoots after each row of knots but probably 3; 11-14 knots per inch (42-56 per dm). PILE: wool; 14 colours: red, orange, light orange, yellow, dark green, green, light green, dark blue, blue, light blue, purple (faded to grey), brown (in the border with shade variations including orange), black, white; asymmetrical knot open to the left and tied around 2 warp threads; average 201 knots per sq. inch (average 2990 per sq. dm). This is a fragment of the field of a carpet. It is covered with a grid-like pattern of fine stems but part of a diamond or lozenge can be seen in one corner. 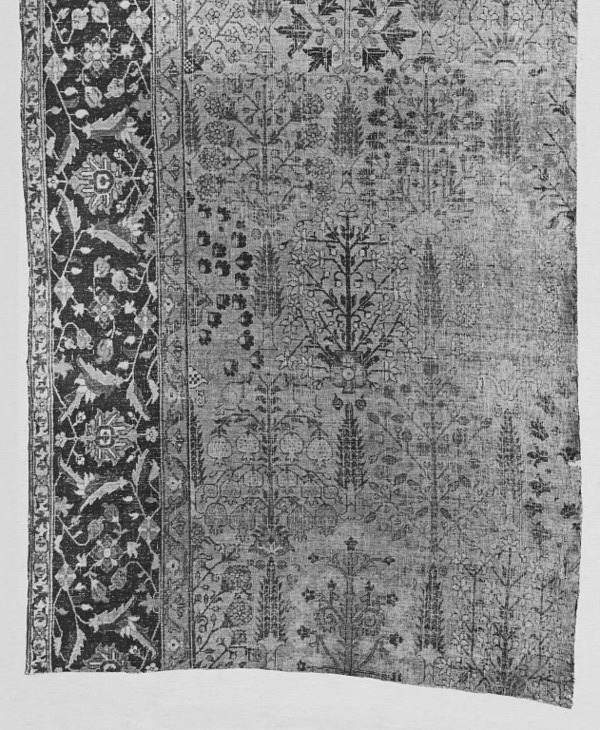 Carpet fragment, from the field; hand-knotted woollen pile on woollen warp and weft; Persian, 16th-17th century. WEFT: white cotton; unable to ascertain spin, ply, twist; 3 shoots after each row of knots; 14 knots per inch/54 per dm. PILE: wool; 11 colours: dark red, red, orange, yellow, dark green, green, dark blue, blue, pink, brown, white; asymmetrical knot tied around two threads and open to the left; 217 knots per sq.inch/3348 per sq.dm. Warp: white cotton; Z4S; 28 threads per inch (110 per dm); depressed. Weft: white cotton; Z3S; light brown wool; Z2S, but light red wool Z2S in the lower part and blue wool Z2S across the central part; 3 shoots after each row of knots, 1 of cotton and 2 of wool; 12 knots per inch (57 per dm). Pile: wool; 12 colours; dark red, red, orange, yellow, dark green green, light green, dark blue, blue, light blue, dark purple (faded), pink, asymmetrical, open to the left and tied around CHECK threads; 168 knots per sq. inch (3135 per sq. dm). Design: Field: orange ground with 10-1/2 bands of trees and flowering shrubs; each one alternates with a cypress tree and these are offset in alternate bands. Carnations, pomegranates, berries and jonquils can be identified and one shrub in the lower end emerges from around red pot. The borders are along the right hand side and the top only. Main border: dark blue ground with the appearance of a floral meander with palmettes, rosettes and 3-coloured leaves. Inner border: light blue ground with angular floral meander: dark red stem with yellow flowers. Outer border: yellow ground with floral meander: blue stem with dark red flowers and purple diagonal leaves. Purchased from Myers & Son. M. H. Beattie, Carpets of Central Persia (London: World of Islam 1976): cat. no. 14 and 49. F. R. Martin, A History of Oriental Carpets before 1800 (Vienna 1908): 87 and fig. 185. This is a fragment of a 17th century Persian carpet. Diamond lattices softened by swirling stems form the underlying design structure on which colourful imaginary blossoms have been placed. WARP: white cotton; Z4S; depressed; 30 threads per inch (122 per dm). WEFT: (1) grey wool, Z2S and (2) white, occasionally red, silk, Z4S; 3 shoots (wool/silk/wool) after each row of knots; 18 knots per inch (66 per dm from a count of 33 per 5 cm). PILE: wool; 16 colours: dark red, red, light red, orange, light orange, yellow, light yellow, dark green, green, light green, dark blue, blue, light blue, dark brown, brown, white; asymmetrical knot open to the right and tied around 2 threads; 270 knots per sq. inch (2013 per sq.dm). This is a fragment of the left hand border. Borders are often ignored when design is discussed, but they deserve equal attention, especially in pre-19th century carpets such as this which combines delicacy and boldness. 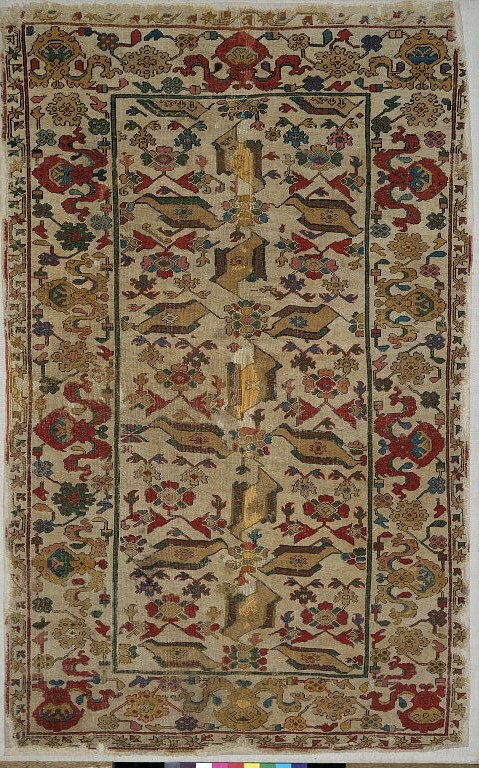 Carpet fragment, part of the left hand border; hand-knotted woollen pile on woollen warp and cotton weft; Persian, 16th-17th century. he carpet designer can simplify the creative process, but still create something dramatic, by using a lattice to form a network of spaces in which he can draw different motifs. The long serrated leaves in this fragment form an obvious lattice, but there are two others formed by thin stems which change colour according to the ground colour of the segment they are in, creating a bold, yet complex, design. WARP: white cotton; Z4S; 24 threads per inch (100 per dm); depressed. WEFT: white cotton and brown and green wool (seem to be using odd bits) wool; Z-spun, unplied; 3 shoots after each row of knots, 2 of wool and one of cotton; 11 knots per inch (43 per dm). PILE: wool; 11 colours: red, orange, yellow, dark green, green, dark blue, light blue, purple, pink, dark brown, white (in the large patch the colours are brighter); asymmetrical knot open to the left and tied around 2 warp threads; 132 knots to the sq. inch (2150 per sq. dm). The carpet designer can simplify the creative process, but still create something dramatic, by using a lattice to form a network of spaces in which he can draw different motifs. In contrast to most 19th century carpet designs based on this principle, older examples, such as this, often have lattices on a grand scale: each of these diamonds measures over 68 cm (26 in) in length. arp: white cotton; Z4S; 22 threads per inch (76-8 per dm); depressed. This design is a bird's eye view, or a map, of a classical Persian garden divided into four beds by two intersecting channels of water. The garden is actually depicted from two points of view at once: from above, giving the architectural plan and from the side, showing the trees and shrubs in profile. WARP: white cotton; Z7S; 15 threads to the inch (57 per dm). WEFT: light red wool; Z3S; 2 shoots; 8 knots to the inch (30 per dm). PILE: wool; 12 colours: dark red, red, light red, yellow, green, dark blue, blue, light blue, very light blue, dark purple, dark brown, cream; symmetrical knot tied around 2 threads; 60 knots to the sq. inch (855 per sq. dm). WEFT: Foundation weft: yellow silk; Z2S; 3 shoots after each row of knots; 94 - 111 knots per dm (25 - 28 knots per in). Pattern weft: (1) silver strip, Z-twisted around a yellow silk core; (2) silver strip, Z-twisted around a white silk core; brocaded over 3 warp threads. PILE: wool; 14 colours: dark red, light red, dark orange, yellow, dark green, green, light green, very light green, dark blue, blue, very light blue, dark brown, brown, white; asymmetrical knot open to the left; 9024 -11544 knots per sq.dm (600 - 756 knots per sq. in). SIDE FINISH: one cord oversewn with dark red silk. END FINISH: Lower: part missing but there are the remains of a tapestry-woven band with an illegible inscription in black and silver thread. Upper: cut. 1. Mikhwah va gul afshan kun az dahr chi miguyi in guft sahargah gul bulbul chi miguyi. 2. Misnad bih gulistan bar ta shahid va saqi-ra lab giri va rukh busi minushi va gul buyi. 3. Shimshad kharaman kun va ahang-i gulistan kun ta sarv bimuzad az qadd-i tu diljuyi. 4. Imruz kih bazar-at pur-i jush-i kharidar ast daryab va binih ganj az maya'i nikuyi. 5. Har murgh bi-dastan dar gulshan-i shah ayad bulbul bih ghazan khwani hafidh bih du'aguyi. 1. Call for wine and scatter roses - what do you want with Time? Thus spoke the Rose at dawn. Nightingale, what do you say? 2. Take the cushion to the garden. You may grip the lip and kiss the cheek of the Beloved and the Cup-Bearer. You may drink the wine and smell the rose. 3. Move your graceful form with pomp and make a harmony of the garden so that the Cypress learns from your stance how to win the heart. 4. Today, when the market is full of the ebullience of buying, acquire and put aside the capital of goodness. 5. Every bird brings a melody to the garden of the King: the Nightingale with songs of love, Hafiz with prayers of blessing. 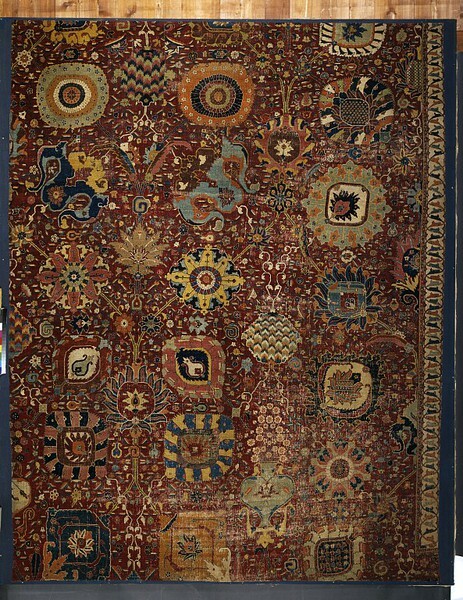 Bequeathed to the Museum in 1910 by George Salting, it was thought to be a 16th century Persian carpet but in the late 1920s it was recatalogued as Turkish, probably mid-19th century. Its attribution is still a matter of vigorous debate. 'Call for wine and scatter roses: what do thou seek from Time? - thus spoke the rose at dawn. O nightingale, what say thou? Take the cushion to the garden, that thou may hold the lip and kiss the cheek of the beloved and the cup-bearer, and drink wine and smell the rose. Proudly move thy graceful form and to the garden go, that the cypress may learn from thy stature how to win hearts. Today while thy market is full of the tumult of buyers, gain and put by a store of the capital of goodness. Every bird brings a melody to the garden of the King - the nightingale, songs of love, and Hafiz, prayers for blessing. 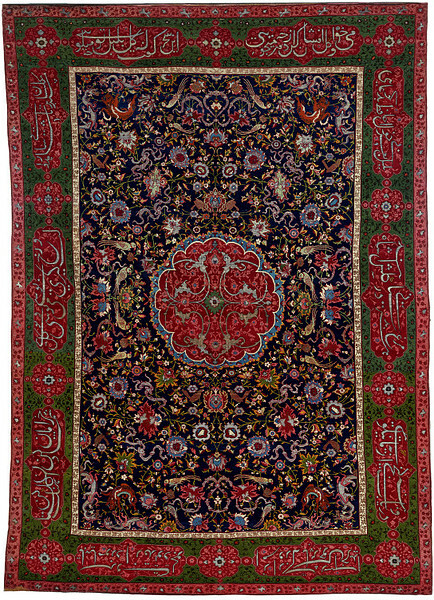 If the Salting Carpet and several related pieces are Persian, and it seems probable, we suggest that they were used as state gifts from the Shah to the Sultan, expressing Persian state power and cultural identity and possibly carrying overtones of political propaganda. 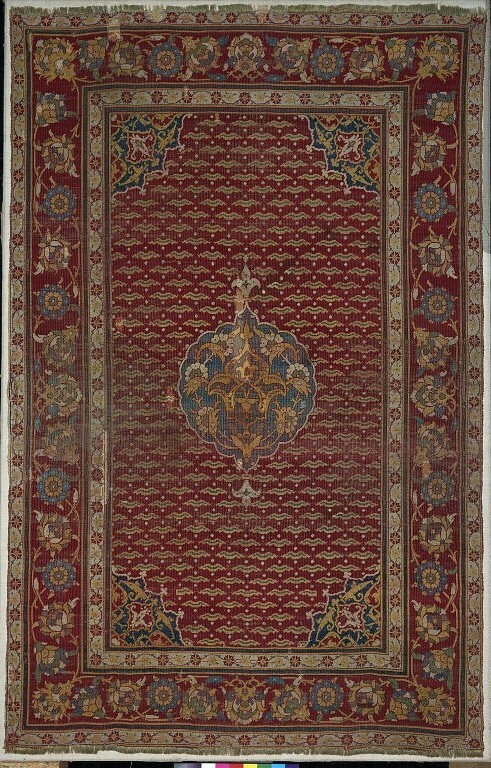 We also suggest that serious consideration is given to the possibility that the Salting Carpet was woven in the 1850s and presented by Shah Nasir al Din (r.1848-1896) to impress on his neighbour his personal wealth and prestige, the skill of his weavers and the rich artistic traditions of Persia. D. Jones & G. Michell (eds. ), The Arts of Islam: Hayward Gallery, 8 April - 4 July, 1976, (London: Arts Council of Great Britain 1976): Cat. no. 56; 97. J. Wearden, "The riddle of the Salting Carpet", Oriental Art vol. XLIII/i (1997): 21-7. E. Lièvre, Musée graphique, IV, 1880-3. M. Beattie, The Rug in Islamic Art: Temple Newsam House, 16 April to 28 May 1964 (Leeds: Temple Newsam House 1964): Cat. No. 18. H. Erdmann (ed. ), Seven Hundred Years of Oriental Carpets (London: Faber 1970) . E. Atil,, Turkish Art (Washington D.C.: Smithsonian Institution Press 1980): Ill. 190; 324. 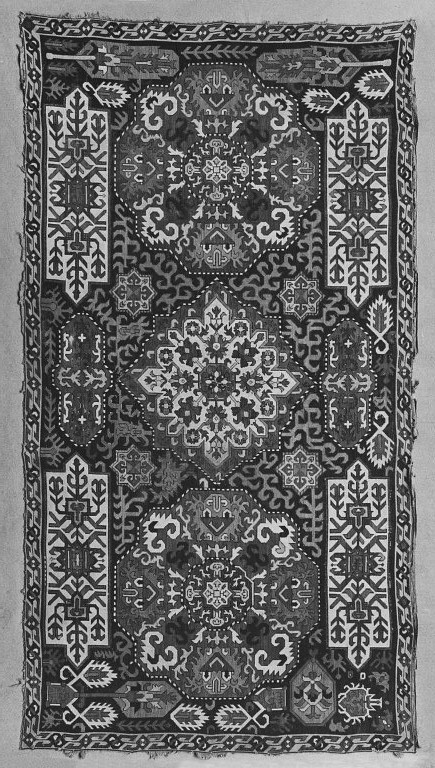 Oriental Carpet and Textile Studies vol. V part 2 (1999): whole volume dedicated to 'Salting carpets'. Carpet weaving in Spain developed during its Moorish occupation in the early medieval period. There is evidence as early as the late 12th century for the export of some sort of carpets from Murcia, in Southern Spain, and Spanish carpets were brought to London in 1255 for the marriage of Eleanor of Castile and the future Edward I. Inventories from the late 13th to the 15th centuries show that Spanish carpets were highly prized in many European countries at a time when almost no floor coverings were being woven elsewhere in Europe. Such relatively small carpets as this were laid on the floor beside beds, placed on or before altars, on tables, chests and cupboards, hung behind chairs of estate and on festive occasions were draped from windows, balustrades and balconies. Spanish version of Large Holbein design: rectangles with plaitwork backgrounds enclosing octagonal frames containing stars with various diaper patterns in different colours on their rays, on a red ground. Cut wool pile on wool warps and wefts. 21 warps and 10 wefts to the inch. 110 knots to the square inch. The carpet has been cut across its width, and about one third of the original design may be missing. The carpet was purchased from a Miss A E Burwood, a private owner in London. It had been offered to the Museum for sale with a group of other textiles. She refers in correspondence to it having been previously purchased for 500 francs, but not where it came from. Described by the vendor as Arabian, it was noted by A F Kendrick to be "of Hispano-Moresque origin, probably dating from the 16th century". The Museum rejected her original asking price of £25 as too high, but eventually agreed to it, "as we do not think it advisable to lose this opportunity of securing an example which may not again occur." Historical significance: The design of this carpet is what has become known (in the 20th century) as the Large Holbein pattern. It is derived from Turkish sources, with a grid of rectangular compartments with large octagons containing stars, which was adapted in Spanish workshops. Most popular textile designs of the early middle ages, influenced by Byzantine styles, were repeating patterns of circles containing animals or birds; in coarse woollen textiles such as carpets it was difficult to render circles satisfactorily so they were made into octagons. Turkish rugs with octagons enclosing stars of various kinds appear in European paintings, but the diaper pattern on the stars here, and the border pattern, which recurs in several of these sort of carpets, seem characteristically Spanish. Such Spanish carpets as this also have a characteristic knotting technique, which involves pile threads wrapped round a single warp end instead of two as was usual in the Near East. The design was given its name because such patterns are seen in well-known paintings by Hans Holbein the Younger and are on a larger scale from the small-pattern carpets which also appear in his paintings. Islamic style carpets are some of the earliest to survive from Spain. The towns in which they were produced - Letur and Alcaraz, in the region of Murcia - are located in the Levantine zone which first flourished under the Almoravids. They were highly sought after by Iberia's Christians and used to decorate palaces and churches. Some were woven with the patron's coats of arms, an aesthetic idea that relates to contemporary designs on lustre ceramics. (M. Rosser-Owen, 2010). Design: Red ground with a multi-side blue medallion containing a ring of red papyrus design. Within the medallion, outlined in a yellow scallop, is a red oval which contains a green octagon with an angular, 8-pointed interlaced star in blue. Extending from the octagon are 8 stylized leaves each containing an elaborate knot and separated by green triangles. Above and below the medallion is an oblong design in blue and green of an arabesque with knots and leaf-like designs. These look out of keeping with the rest of the design; they are curilinear and resemble Italian embroidery. At each corner, an octagon alligned to two triangles provides a corner frame to the medallion and in each far corner an 8-pointed star together with the arabesque oblong creates an upper and lower band. NB: light blue ground with papyrus meander with red circles alternating with green cartouches. At the sides the central cartouche becomes a green circle. Within the cartouche is a blue hexagon. The circles and cartouches are decorated with the papyrus design which appears as though it were a supplementary border along either side of the cartouches. Along the lower edge of the main border this effect is accentuated because the ground is a darker shade of blue. Inner and outer (outer missing top and bottom); red ground with a yellow angular meander with corroded black blocks and yellow sprigs. Warp: wool; possibly yellow with the ends dyed green for the fringe; S4Z (at least 4), 22-25 per inch,(88-100 per dm). Pile: wool; red, yellow, white, green, light blue, black. Asymmetrical, open to the left, tied round 2 warp threads. 121-138 knots per sq. in (1936-2200 per sq. dm). 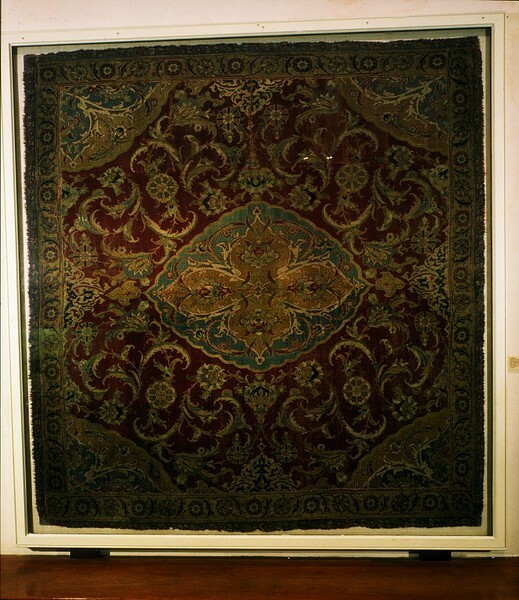 This is one of the very few examples of Mamluk carpet-weaving that has survived from the reign of sultan Qa’itbay. The Egyptian weavers who made it drew on Iranian techniques and designs. Qa’itbay was an outstanding example of a cultured Mamluk ruler who was brought to Egypt as a slave. In 1435, when he was in his early twenties, he was purchased by Sultan Barsbay and trained as one of his military attendants. Because of his great ability, Qa’itbay rose to become commander-in-chief, and in 1468 was acclaimed sultan. The reigns of Mamluk sultans could be very short, but Qa’itbay ruled unchallenged for 28 years, dying in 1496. During this time, he earned a reputation for piety. He founded and restored many religious buildings and supplied them with minbars (mosque pulpits), lamps and other elegant furnishings. Keen to stimulate economic activity, Qa’itbay encouraged the revival of skills such as inlaid metalwork and the introduction of new industries, including carpet-weaving. 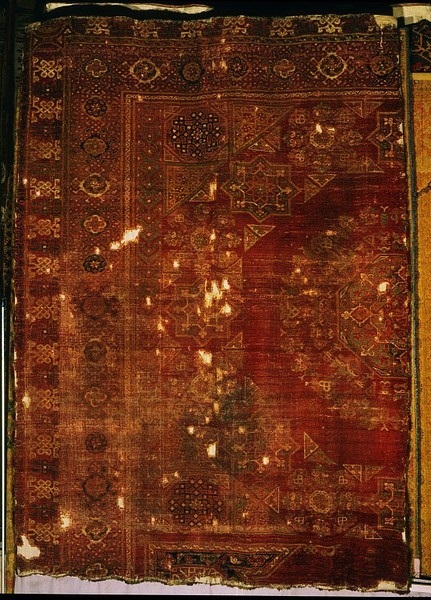 Carpet fragment, probably part of the lower left hand corner and half the width. Analysed from the front because it is lined. Design: Field: red ground with one central and two halves of a device on curvingfloral stems that fill the field. The device of a diamond has a palmette at each point within an open spray of saz leaves on the horizontal and a closed spray of leaves on the vertical. On the vertical a rosette separates each device. Main Border: red ground with well-drawn clusters of green/blue flowers - carnations, rosebuds, tulips and hyacinths alternating with a shield-like palemtte which forms the diagonal of each corner. Inner and Outer borders: blue.green ground with small red rosettes separated by a pair of tiny red triangles. 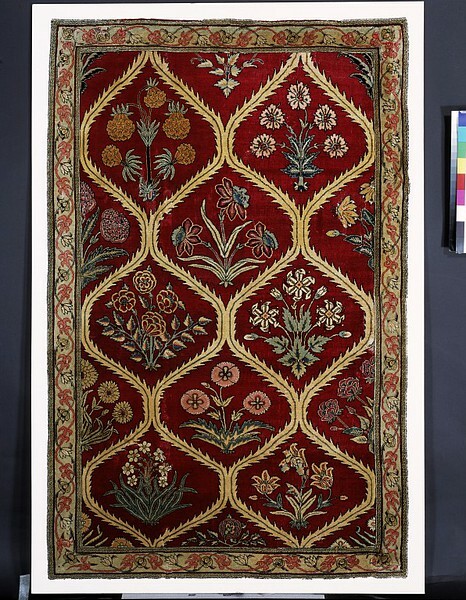 Woollen pile carpet, featuring a design of large and small flowers in various colours against a crimson ground. The border is filled with panels and circles with a lace-like outline. Weft: red silk(? ); not able to determine spin, ply, twist; 2 shoots after each row of knots; 16/inch rows of knots, 64/dm. Side Finish: incomplete, but evidence to suggest returned weft around outer warp. No evidence of a cord. Design: Dark red ground with a central row of small blossoms and palmettes and 2 half rows down each side. Ther are 2 intermediate rows of larger blossoms; in each there is a single below and above the centre and a vertical pair at the centre, all with a dark blue scalloped outline. From the base of each blossom extends a pair of sprays of small white flowerheads-these loop together in the central part of each row. Below the lowest blossom and above the highest extend long, graceful saz leaves and blossoms. Towards the top of the field this design squashed. Main Border: dark red ground with dark blue cartouches alternating with circles. Each cartouche contains a central light blue rosette from which extend a pair of dark red composite blossoms and leaves. The elaborate white cloudband frame around the cartouches continue to encircle both a smaller circular flower and the large dark blue circular rosette, which lies on the other side of it. The small circle lies between 2 half rosettes at the edges of the main border. The upper main border is squashed. Inner and Outer borders: Green ground with floral meander of alternating dark blue and dark red rosettes on dark blue stem. Guardstripes: reciprocal pattern in dark red/dark blue outlined in white. 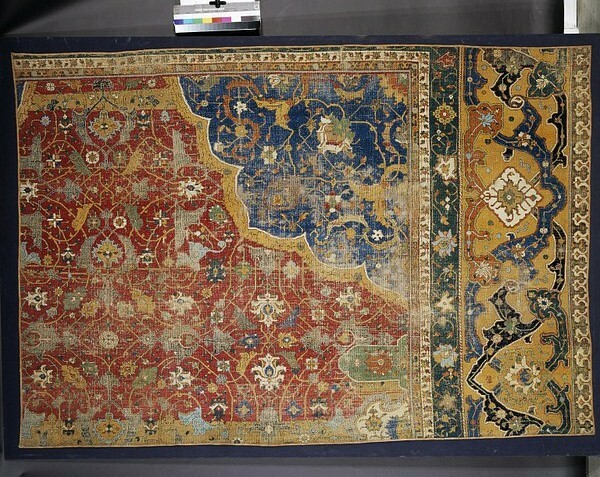 Although this 16th century Ottoman Court Carpet may look complete, a close examination of it will reveal at least six large pieces which have been seamed together. There is an almost identical square carpet in the Musée des Arts Decoratifs in Paris and fragments in Washington, Cairo, Stockholm and in the V&A (336 and 337-1892). Altogether there are 21 related pieces scattered across several collections. 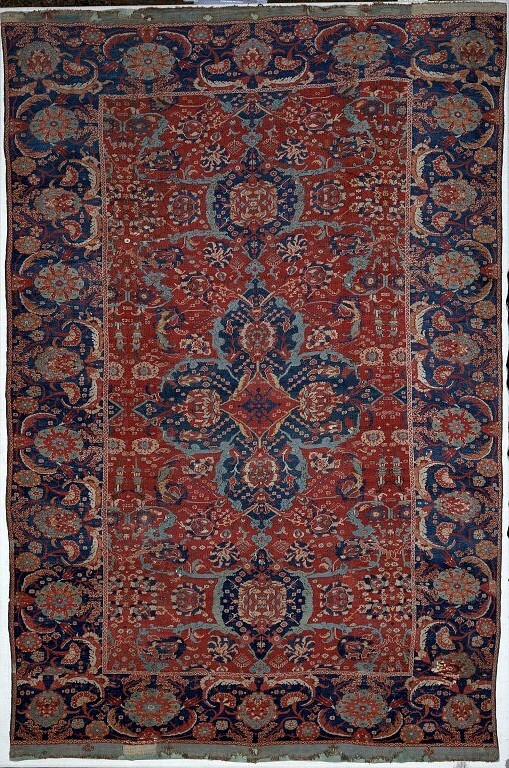 Originally these would have formed a pair of large carpets decorated with a repeating pattern of oval medallions. 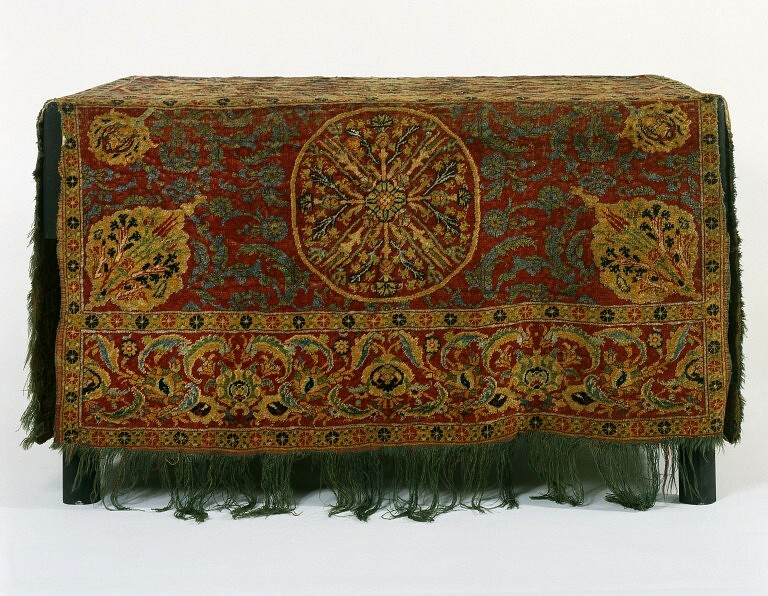 The threads used in the warp of this carpet were dyed green so that they would form a coloured fringe as it hung over a cube-shaped table. The warp was prepared so that the greatest width of the carpet could be accommodated on the loom and the weavers tied knots within the required outline. When the carpet was finished, the excess warp threads were trimmed and secured. Table Carpet, hand knotted woollen pile on woollen warp and weft, woven to shape asymmetrical knot. WARP: green and yellow wool, often twisted together; S3Z; 26 threads per inch (100 cms); depressed. WEFT: yellow wool and red wool; unable to ascertain number of ply, but the threads are S-spun, Z-plied; 3 shoots after each row of knots; 15 knots per inch (60 knots per dm). PILE: wool; 8 colours: red, yellow, green, dark blue, blue, light blue, brown, white; asymmetrical knot open to the left and tied around 2 threads; 195 knots per sq. inch (3000 per sq. dm). SIDE FINISH: Web of 9 cords (the outer one is composed of three warp threads and is thicker than the others) worked with yellow wool; the outer cord is oversewn with red wool. END FINISH: Maximum of 8" (20.5 cms) loose green warp ends. DESIGN: Field: Central square: red ground containing central roundel with carnations, hyacinths and tulips coming out of central boss. Outer roundel has tulips, roses, carnations, daisies and tiger stripes. Each corner contains a floral spray. Flaps: the four flaps have inner roundel as above but also corner medallions with the blue/green carnations, hyacinths and tulips on a yellow ground. Main border: elaborate saz blossoms with curling leaves on a red ground. Narrow borders: which separate flaps and field; bracketed blue and red blossoms on yellow. Design: the pattern in the centre is directional and was woven upside down. Field: dark red ground filled with offset bands of small green and yellow tiger stripes alternating with bands of single white dots. In the centre is a scalloped blue medallion with white pendant trefoil at either end. As displayed: the central elaborate light yellow trefoil is within a floral wreath of 6 white rosettes with leaves. Each corner of the field has a 1/4 of a dark blue medallion within a serrated white edge, each point ending in a white cross. Within the medallion is part of a complex red and yellow design. Main Border: dark red ground with a double floral meander, breaking in the centre of each border. Yellow stems with blue and yellow composite rosettes and dark red, yellow, green, blue and black composite blossoms. 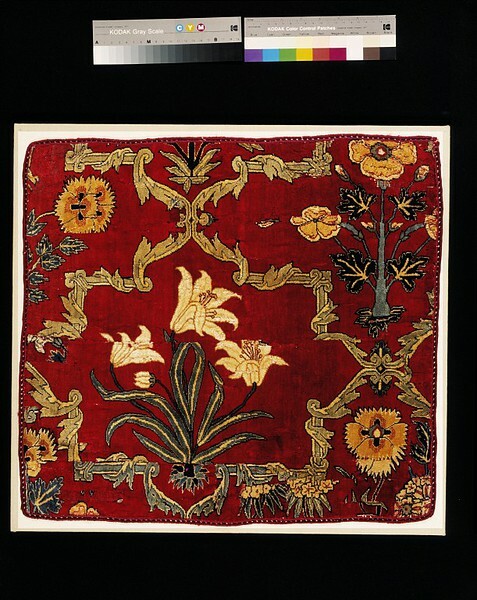 Inner and Outer borders: white ground with dark red floral meander bearing yellow and dark red rosettes. Warp: yellow wool, S4Z, depressed. 24-26 per inch; 98-104 per dm. Pile: wool, dark red, yellow, light yellow, green, dark blue, blue, black, (corroded) white. Asymmetrical, open to the left, tied round 2 warp threads. 132-152 knots per sq. in (2107-2236 per sq. dm). Verlagshanellung GmbH, 1966, plate 249, pp. 202, 206. CFs: (all to one carpet in the Metropolitan, NY). 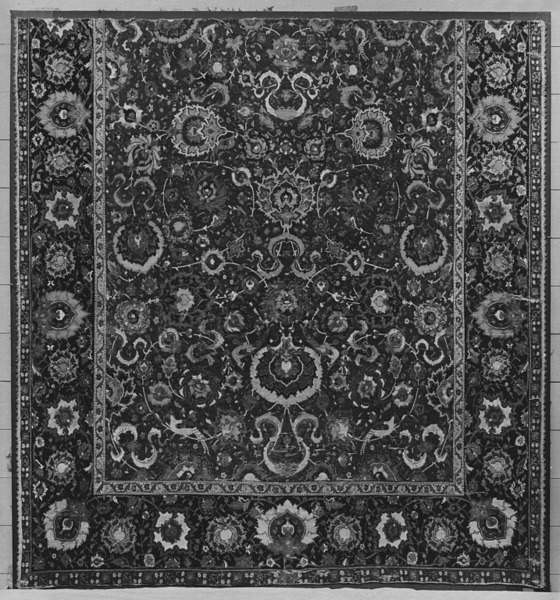 Yetkin (1981) plate 75, "Ottoman Court Carpet, 17th c", NB. p.126 "The general appearance of the rug is very close to the book bindings of the period". Dimand (1973), fig. 194, "Medallion rug, court manufactory, probably Istanbul, second half XVII century". he pattern on this carpet fragment shows how some designs filled the field with small-scale repeat patterns. This example has rows of octagons of different sizes, rings of knotwork, and arabesques. Patterns of this type appear in Iranian paintings of the early 15th century, and in European paintings from the mid 15th century. 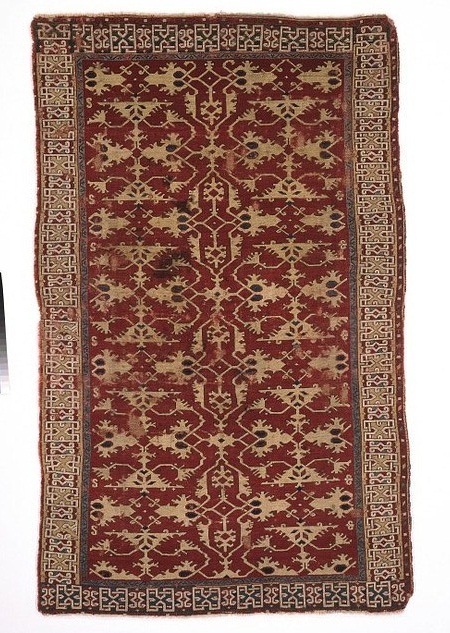 Carpet fragments, hand-knotted woollen pile on woollen warp and weft; Turkish; 16th century. Weft: red wool; Z-spun, unplied; 2 shoots after each row of knots; 9-11 shoots per inch/34-39 per dm. There are some lazy lines. Pile: wool; 9 colours: dark red, red, dark green, green, dark blue, blue, light blue, black [corroded], white. Symmetrical knottied around two warp threads; 80 knots per sq.in/1095 per sq/dm. Pile carpets are one of many types of floor covering used in the Middle East. They are the most familiar to western Europeans as they have been imported from Turkey since at least the mid-15th century. Examples appear in Italian Renaissance paintings and are also depicted by north European artists such as Hans Holbein. Certain carpet designs became known in Europe by the names of the artists who painted them, including Holbein and Lorenzo Lotto. A major centre of carpet production was the town of Usak in western Turkey. Weavers there began to use new designs based on medallions of different types during the reign of Sultan Mehmet the Conqueror (1451–81). Mehmet himself probably commissioned these designs. They were then used in commercial production for several centuries afterwards. 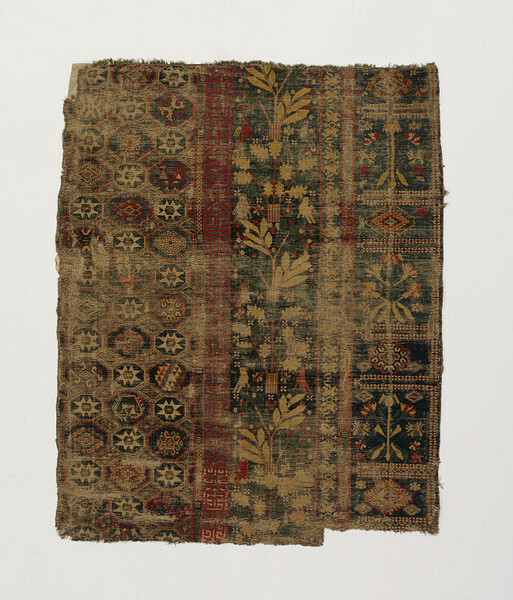 This fragment is made up of a number of pieces cut from the same carpet. The original design was one of the most accomplished variations of the so-called 'star Usak' pattern, and it may be one of the earliest examples. WARP: white wool; Z2S; 16 threads per inch (64 per dm). WEFT: red wool; Z spun, unplied; 2 shoots after every row of knots;10 knots per inch (40 per dm). PILE: wool; 9 colours: red, yellow, dark green, light green, dark blue, blue, black, white; symmetrical knot tied around 2 threads; 80 knots per sq. inch (1280 per sq. dm). 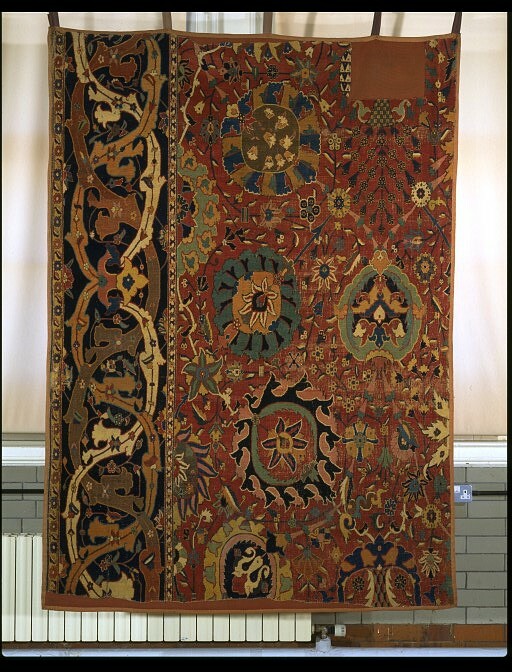 This 16th-century 'Star Ushak' carpet should be compared with the Medallion Ushak displayed to the left [T.71-1914]: the angularity of its designs and the stylisation of the tracery between the main motifs is characteristic of many Turkish carpets. 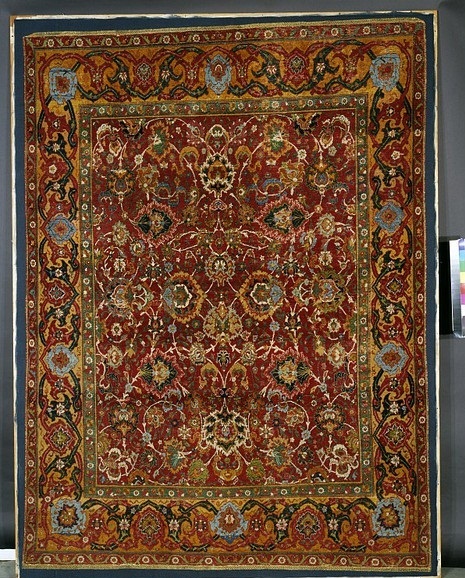 This carpet has a knot density of 52 per square inch (832 per sq.dm) whereas the Medallion Ushak has a higher knot density (104 per square inch / 1664 per sq.dm), and this enabled its weavers to achieve more delicacy and naturalism. This carpet had been repaired before it was purchased by the Museum. Areas of re-knotting, especially in the corners, would have matched perfectly when first completed, but have faded badly over the years. 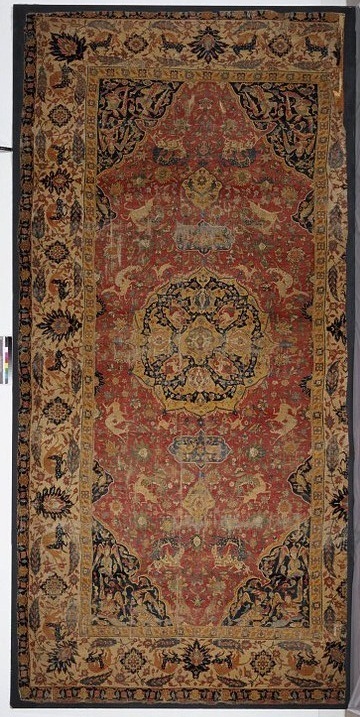 From the evidence of 16th and 17th century paintings, this type of small, brightly coloured Turkish carpet remained popular in Europe for almost 200 years. Although variations are known, the design is characterised by a grid-like arrangement of stylised octagons and crosses in red and yellow. 'Lotto' carpets were woven in commercial workshops in western Turkey, probably near the port of Smyrna (modern Izmir), from about 1516 to about 1700. They were exported in large numbers to central and western Europe along two main trade routes: across the Mediterranean to Italy and Spain, and along the rivers Danube and Rhine to the Low Countries. In a pile fabric, such as this carpet, the foundation consists of two sets of threads, warp and weft, which interlace at right angles. The pile is created by tying a knot of coloured thread around two adjacent warp threads, building up the design row by row while the foundation is being woven by the insertion of weft. It requires only a simple loom and is easily done by hand. In this carpet there are 1,474 knots per square decimetre. 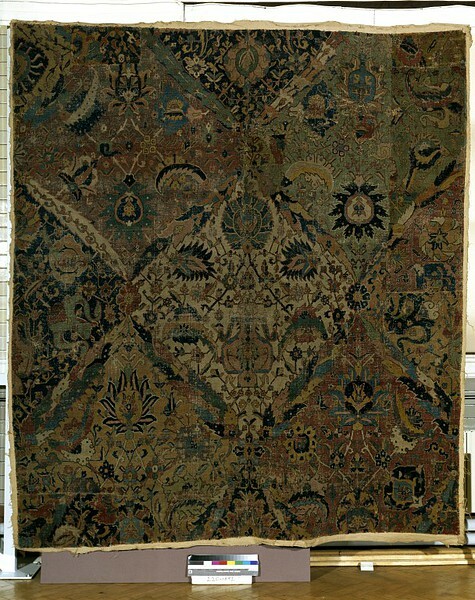 Carpet, Lotto design, hand knotted woollen pile on woollen warp and weft, Turkish, 16th/17th century. Weft: red wool; Z2S; 2 shoots after every row of knots; 11 knots per inch/44 per dm. 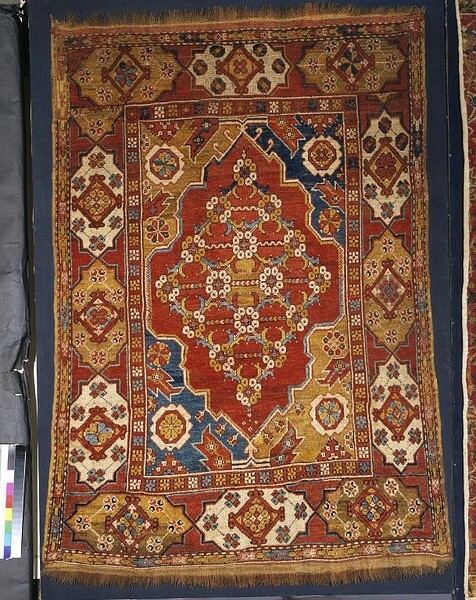 There are two obvious features in this carpet: a large area of re-knotting in the centre and the fact that the upper border has been knotted in slightly different colours - the dark brown used in the other three borders is missing. This yellow and red design was popular for over a century. It was worked from drawings and so its proportions could be easily changed. WARP: white wool; Z2S; 17 threads per inch (70 per dm). WEFT: red wool; Z-spun, unplied; 2 shoots after each row of knots; 11 knots per inch (60 per dm). Several 'lazy lines' are evident. PILE: wool; 8 colours: red, light red, yellow, green, blue, dark brown, brown, white; symmetrical knot tied around 2 threads; 93 knots per sq. inch (1750 per dm). 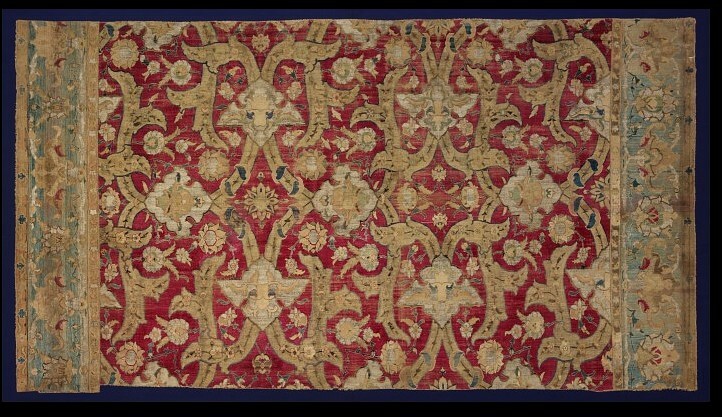 Carpets with this distinctive yellow and red design are often called the Lotto carpets because the Italian artist Lorenzo Lotto [c.1480-1556] is said to have depicted several in his paintings. 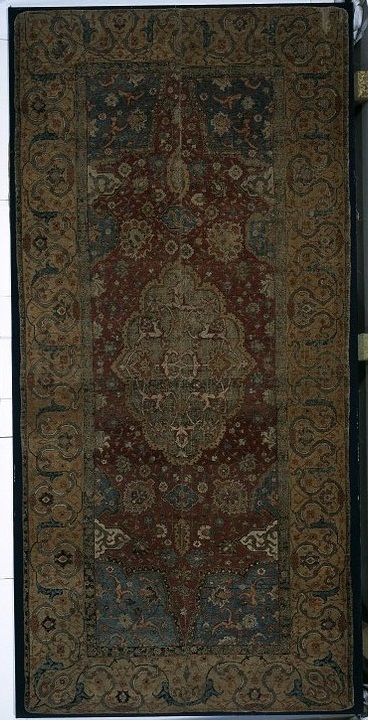 There are two obvious features in this carpet: a large area of re-knotting in the centre and the fact that the upper border has been knotted in slightly different colours - the dark brown used in the other three borders is missing. This yellow and red design was popular for over a century. It was worked from drawings and so its proportions could be easily changed by selecting which part of the repeating design was to be woven. There is horizontal repair across most of the upper part of this carpet. If you look at the left hand end (just inside the red field) you will see that the lines of knots above and below the repair are not parallel. This part of the carpet was badly woven and a ridge would have formed when it was on the floor. Someone later cut the carpet and rejoined it to make it lie flat. The repeating pattern on this carpet was used in other Ottoman textiles. 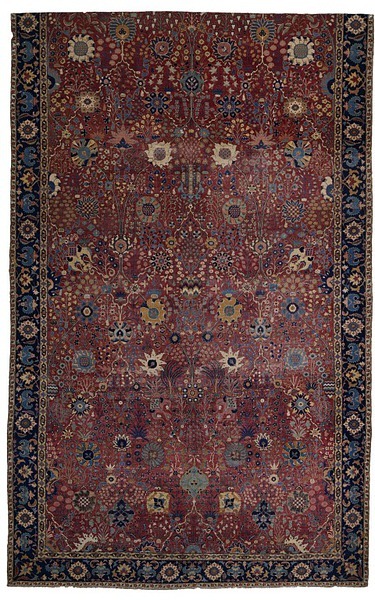 It evolved from the carpet designs with a central medallion that originated in Iran. These were adopted by Turkish weavers during the late 15th century. 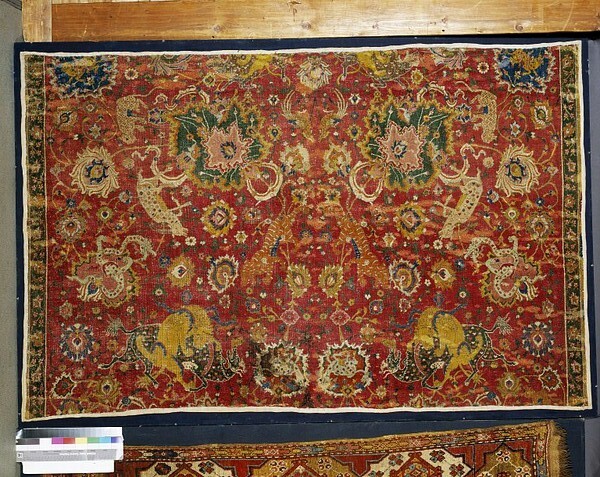 This carpet was made in Usak, in western Turkey, a major centre of carpet production. Weavers there began to use new designs based on medallions of different types during the reign of Sultan Mehmet the Conqueror (1451–1481). Mehmet himself probably commissioned these designs. They were then used in commercial production for several centuries afterwards. Sold (with silk brocade T.52-1920) for £21.10. by Harold Wallis Esq., St. Albans, Godstone Road, Purley, from his father's estate and already on loan. "Woollen Rug, Asia Minor; 16th century". 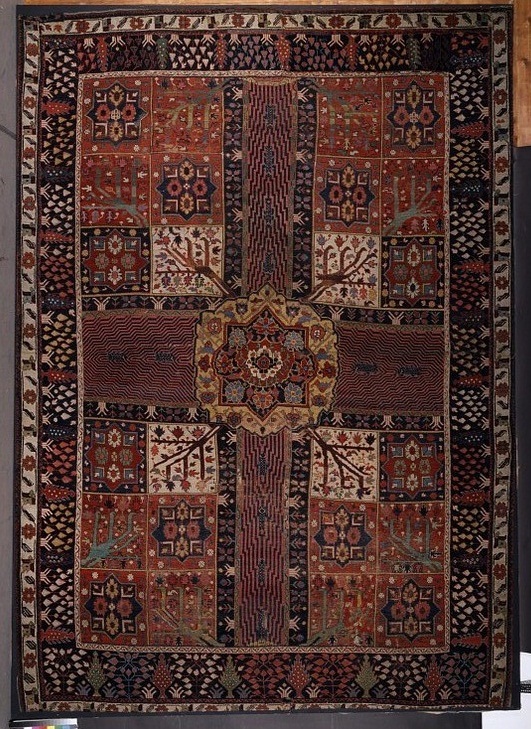 "A 16th/17th century Turkish carpet thought to have been woven in Ushak. 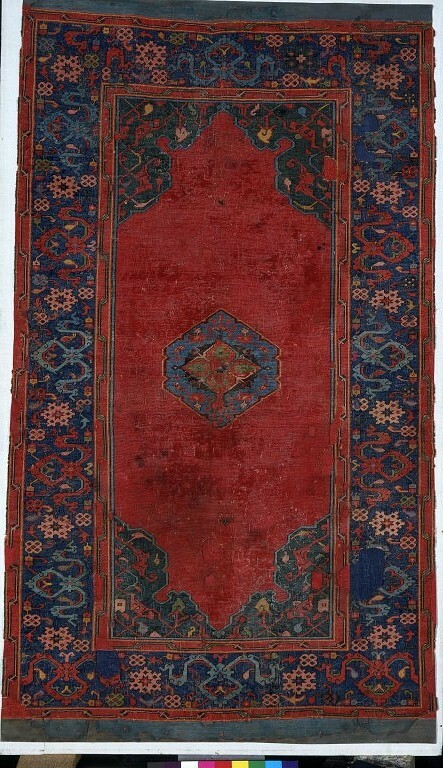 The strong red and blue colouring is reminiscent of the colours used in the Star and Medallion Ushaks displayed to the left and the cloud bands and stylised rosettes in the main border are similar to those in the Bird Ushak carpet displayed below. The undecorated field relies on the intensity of its colour for visual impact." Illustration and comment "Turkish Carpets in the V & A" by M. Franses and R Pinner (intro by Donald King), analyses by S. Jarman. Hali 1984, Vol. 6, No. 4, p.354, 373, 374, 375, 380. Warp: white wool; Z2S; 16-18 per inch (64-72 per dm), (less at right and more at left). Weft: white wool; Z2S; 2 shoots, 11-12 knots per inch (44-48 per dm). Pile: wool; 9 colours: red, dark yellow, yellow, green, blue, light blue, pink, black, white. 88-108 knots per sq. inch (1408-1728 per dm. ); symmetrical knot around 2 threads. 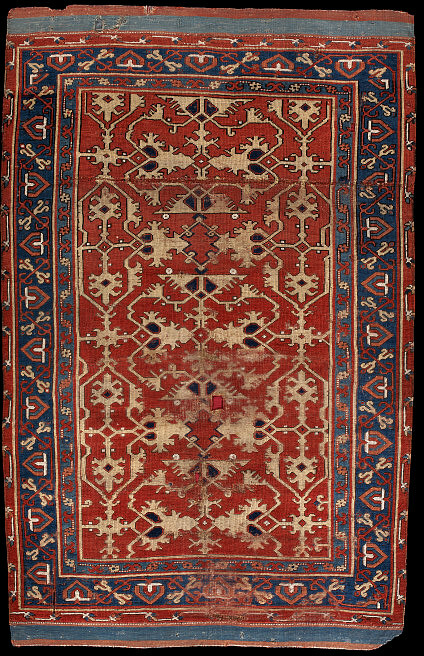 When carpets were first being grouped and studied in the latter part of the 19th century, this type of 16th/17th century Turkish carpet was called a Bird Ushak; 'Bird' because the main motif in the field can sometimes be seen as a humming bird and 'Ushak' after a carpet-weaving area in western Anatolia. It is unusual for a carpet to have the same colour field and main border but this arrangement is typical of this group. There is an area of re-knotting down the centre of the carpet, indicating that it must have been folded along that line and stored that way for a long period. 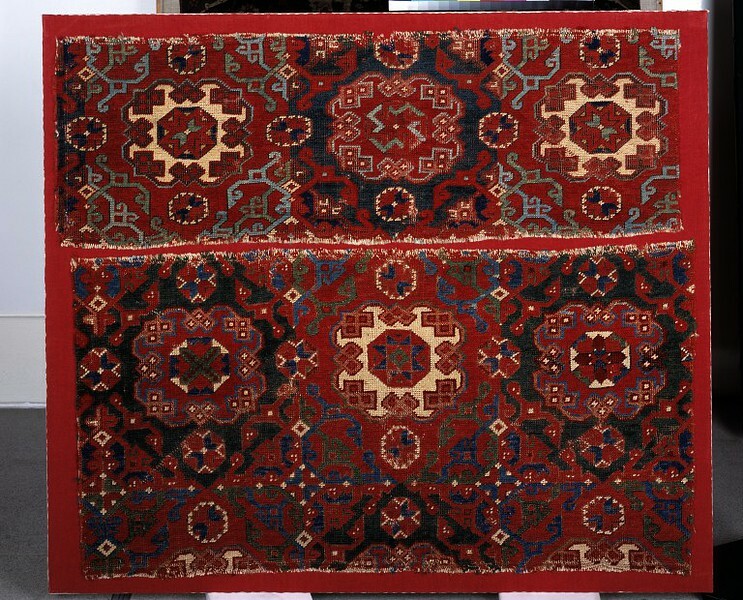 Wool carpet woven in 9 colours: aubergine, blue, blue-green, brown, green, ivory, pink, pink-red, blue red; centre has a purple cartouche having a pattern of angular flowering stems, symmetrically arranged, and issuing from two vases. The spandrils at the four corners are filled with floral ornament in blue on a red ground. The broad border is filled with cartouches, alternating with star-shaped panels, all enclosing floral devices. Weft: red wool; 2 shoots, 10 per inch (4 per cm). This 17th century Turkish carpet belongs to a group commonly called Transylvanian carpets because large quantities of them have been found decorating churches in the Transylvanian region of Romania. The carpet narrows toward the top which suggests that the warp threads were, accidentally, more closely spaced around the upper beam of the loom than they were around the lower beam. The weavers of this carpet were knotting the border designs by copying a drawing which showed only a straight section of the repeating pattern. It was simple to weave this along the lower borders and then begin it again for the sides, but they had to truncate the side pattern in mid-motif once the field design had been completed. Carpets in which the borders have been designed to flow around the corners were woven from more detailed, and therefore expensive, designs. McMullan (1972), illus. XXXI "Turkish, double-niche". nb. elaborate 'shouldered' trefoil border, the main border - and inner/outermost 'chain' border. Also illus. XXXII for stars in main border. C.G. Ellis (1988) illus. 32, "Transylvanian Rug, European Turkey (Wallachia, Romania? 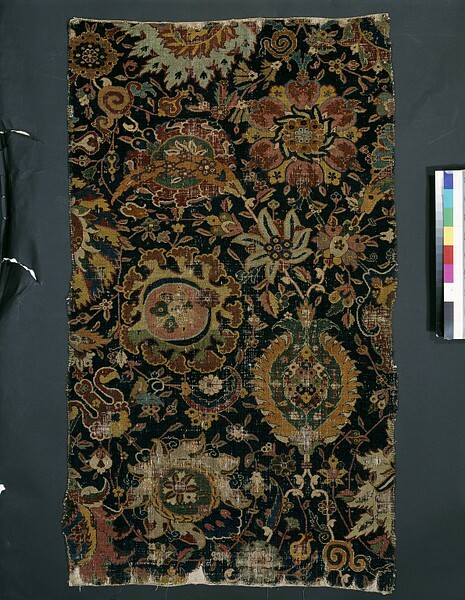 ), 18th century... rugs of this type... are ornamented with palmettes and floral trails which may grow out of two-handled vases (so-called mosque lamps)..." NB: working note on knotting. Also note comment on illus. 31 (McMullan) "which reproduces the older Transylvanian form in which (the cartouches) alternate with eight-pointed stars". Batari (1994), illus. 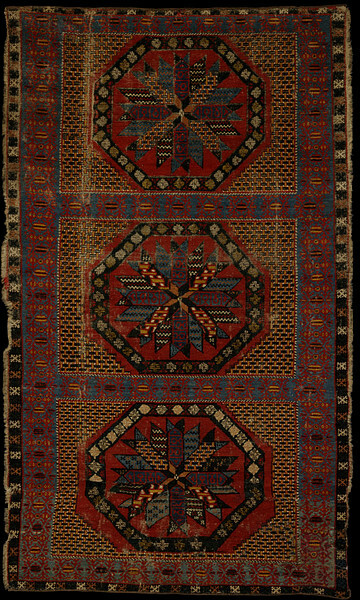 50, "Transylvanian" Rug, Usak, about 1600". NB: decoration on vase/lamp, outermost lower border, trefoil border detail, main border design and layout. Also illus. 52: NB. suspended lamp/vase (suspended from base in lower niche) and similarly decorated as in illus. 56 ("first half 17th century"). Also illus. 55 for elaborate trefoil and main border stars. Carpets with this type of design are often called Transylvanian carpets because a large number of them were hung in the main church in Brasov, Romania, in the region known as Transylvania. 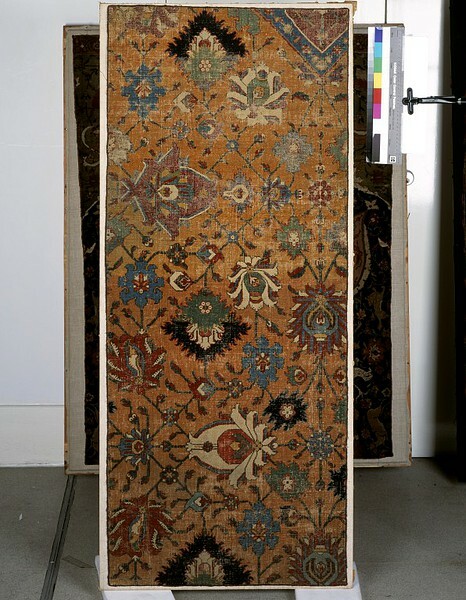 It is not certain whether this type of carpet was woven in Turkey or in one of the Ottoman provinces in south-east Europe, or in both places. Note how the pattern in the border of is truncated abruptly just below the upper border. It is a simple repetition of two cartouches which the weavers followed until they had woven the required length and then they stopped, and began work on the upper border. The weaver on the left hand side was weaving shorter and fatter cartouches indicating that they were interpreting a sketch. Side Finish: Left: web of four cords overcast with yellow wool; Right web of three cords overcast with yellow wool. End Finish: Lower: maximum of 3.5cm (1.5 in) plain weave with yellow wool. Upper: maximum 2.5cm (1") plain weave with red wool and 1.9 cm (0.75 in) plainweave with yellow wool. 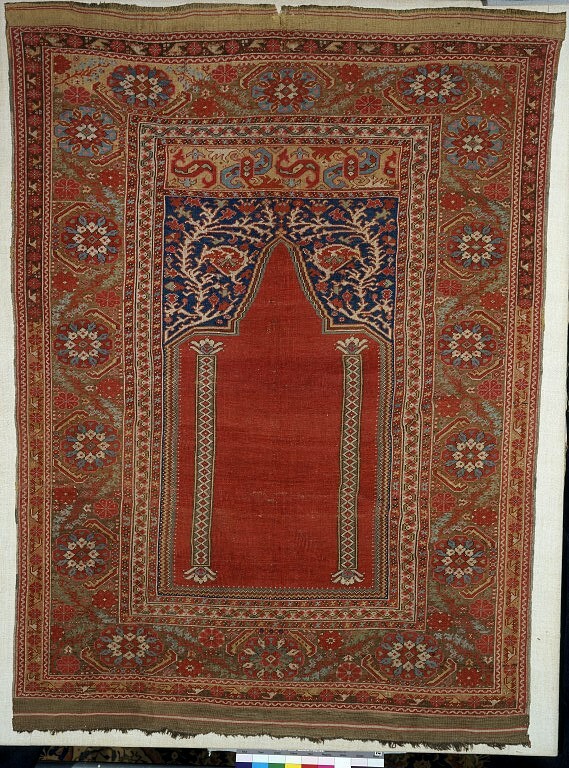 This carpet, with its prominent single niche, is in a style often referred to as a prayer carpet. Since this implies that its specific function was for use during prayers, and this may not always have been the case, modern usage prefers the term 'single niche' carpet. It is woven from goat hair, with a red niche in the centre, and the spandrels occupied by flowering stems on a blue ground. The border is composed of symmetrically-arranged floral designs and has narrow bands of flowers on either side. 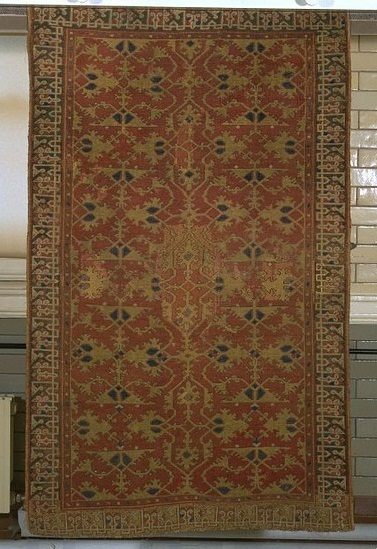 This carpet shares many features with that on the left [409-1880] - the same shape of niche, the same decoration in the spandrels and in the panel above the niche, the same number of borders - but this carpet is a more balanced and spacious design, which may indicate this is an earlier version. Both were made in the Ghiordes region of western Turkey. 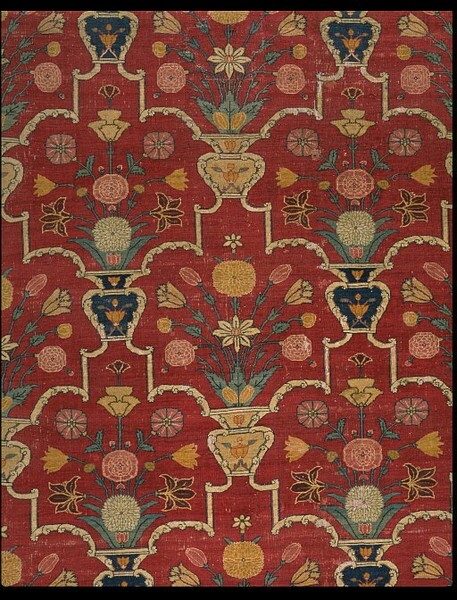 THE DESIGNER of this 16th century Turkish carpet has taken and enlarged some of the most characteristic elements of Ottoman Court carpets - composite blossoms, sprays of flower heads, curling leaves - but they have been woven with a symmetrical knot (86 per sq.inch/ 136 per sq.dm) which has resulted in a certain degree of stylisation. Despite this, the tulips, hyacinths and carnations in the borders have been delicately portrayed. WARP: white wool, some brown, Z2S; depressed, 20-21 knots per inch (80-84 per dm). WEFT: wool, Z2S; 2 shoots after each row of knots, 10 rows per inch (40 per dm). END FINISH: not original, rewoven. DESIGN: Field: dark brown ground divided into 3 rows of jagged diamonds and between them 2 rows of irregular large, waisted diamonds. The pseudo lattice is composed of horizontal zigzags of elongated, stylized leaves: 3 zigzags in yellow, one in red and blue, and 1 in blue and green. Each leaf has a central stem bearing rosettes. The yellow ones also contain pairs of cloud bands in 2 colours. In the long panels are mythical beasts. The topmost pair are spotted dragons with floral tails. In each of the lower is a pair of embattled animals. In the outer triangles are, at the bottom, elaborate cones; there is a third one in the centre at the top, and above, a palmette, a composite blossom and, at the top, a pair of small spotted animals. Further large blossoms link the zigzags. The motifs in the right hand of the carpet seem to be less finely woven - details are lacking. It suggests 2 different weavers working from a drawing, not a cartoon. Border: missing from bottom and from top right hand corner. It has been rewoven. White ground with an angular floral meander. The downward diagonals are decorated hexagonals. The meander links these with large yellow rosettes from which sprout purple and blue lilies. This cover is an example of embroidery from Azerbaijan. It dates from the late 17th century. At that time Azerbaijan was larger than the modern republic. It reached further to the south and the west, with Tabriz as its main town. Technically embroideries from Azerbaijan fall into three groups. This piece, worked in cross stitch, is an example of the earliest. Until recently textile historians thought that these embroidered designs were copied from hand-knotted carpets. However, we now think that the carpet-weaving industry took its inspiration from these embroideries and not the other way round. Carpet of knotted-pile in pashmina (goat-hair) on silk warps and wefts. With a design of a serrated ogival trellis with naturalistically-rendered flowering plants in each compartment. Vertical wavy stems in yellow, forming ogee-shaped compartments enclosing devices of narcissus, rose, tulips, poppy and other flowers, in colours on a red ground. A narrow border of interlacing wavy floral and leafy stems, in colours, on a greenish-yellow ground, runs around the outside. There was originally an outer floral border which is now missing. Crill Rosemary, in The Indian Heritage. Court Life and Arts under Mughal Rule, V&A, 1982, cat. 200, p. 76, ISBN 0906969263. Daniel Walker, 'Flowers Underfoot', Metropolitan Museum, New York, 1997, cat.no.27. Given by V. Behar, Esq. 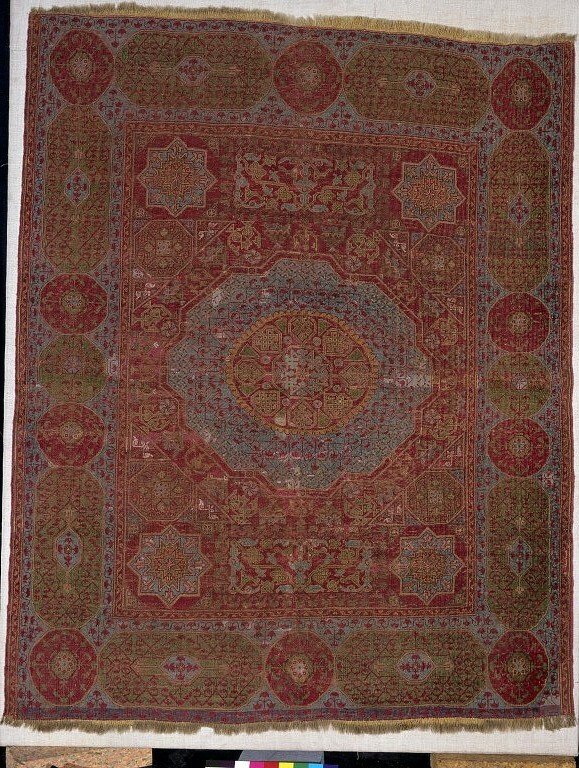 Square fragment of a carpet. Made up of several fragments sewn together. Wool with cotton warps and silk wefts. Woven in fine cut and knotted woollen pile on cotton string warps, in about 28 knots to the inch. With a large trellis pattern of cross-shaped compartments outlined by angular and scrolling foliate bands in shades of blue, green and fawn, enclosing white-lily and other flowering plants on a plain red ground. Woollen pile on cotton warp (2 levels, 42 to the inch) and crimson silk weft (3 shoots per row of knots). Sehna knots, about 440 to the square-inch. 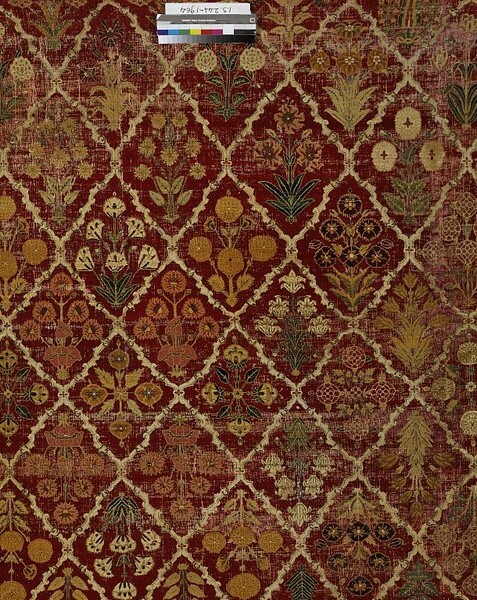 Portion of a darbar carpet woven in coloured woollen pile upon white cotton warps, and crossed by a triple weft made of one red silk shoot between two red cotton shoots. The borders are missing, and the pattern of the field is composed of horizontal rows of Ming vases containing plants bearing poppies, irises, roses, tulips and other flowers on a kermes-red ground within strapwork lobed compartments in white and green. The white cotton 8-ply warps number 31 to the inch. The triple weft of one silk thread between two salmon-coloured two-fold threads of cotton runs between the rows of Persian knots, which number about 260 to the square inch. The colours are red, white, blue, crimson, ochre, yellow and purple. Carpet of cut woollen pile on warps of twisted bleached cotton, transversed by untwisted salmon-coloured cotton weft. The pile is coarse averaging 49 knots to the square inch, on 14 warps to the linear inch and 7 double shoots of weft to the vertical inch. The pattern consists of an orderly arrangement of flowering plants, reversed from the medial line, within a narrow border of rosettes on leafy stems running between 'rope'-fillets. The colour of the main field is dark crimson and the border is indigo blue. For the plants, the guard design and fillets, the colours are blue, brown, yellow, salmon, pink and mauve. 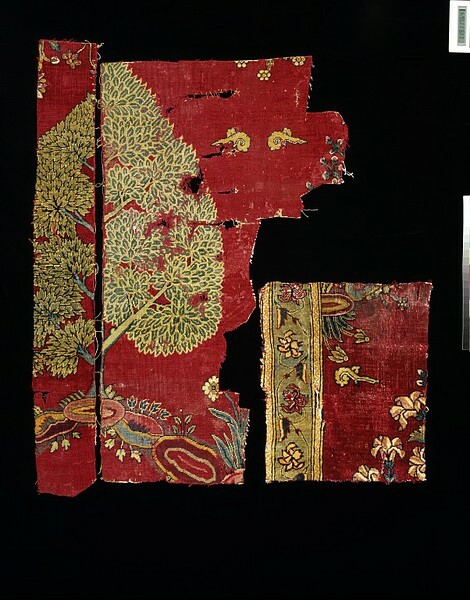 These fragments come from an extremely finely woven carpet with a design of trees and flowers. The velvety appearance of the pile comes from the use of pashmina - the fine hair from the underbelly of the Kashmir goat, from which Kashmir shawls are made. 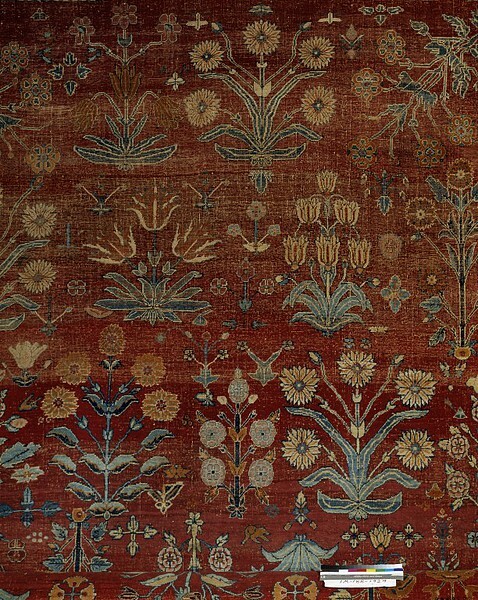 This was used for pile carpets in preference to silk by carpet-weavers of Mughal India in the 17th and 18th centuries. 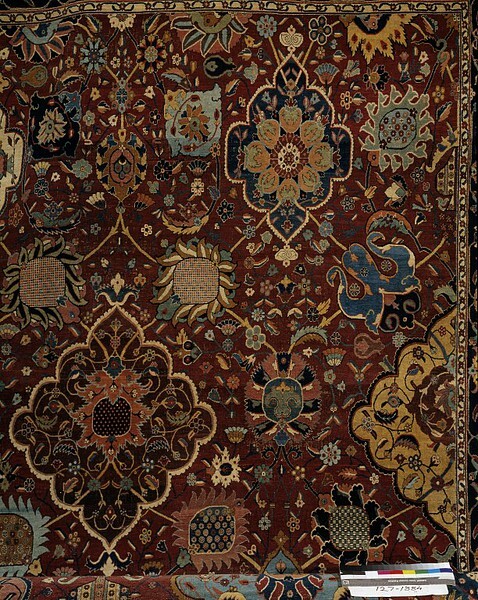 Silk thread was used for the warps and wefts that form the underlying structure of the carpet. 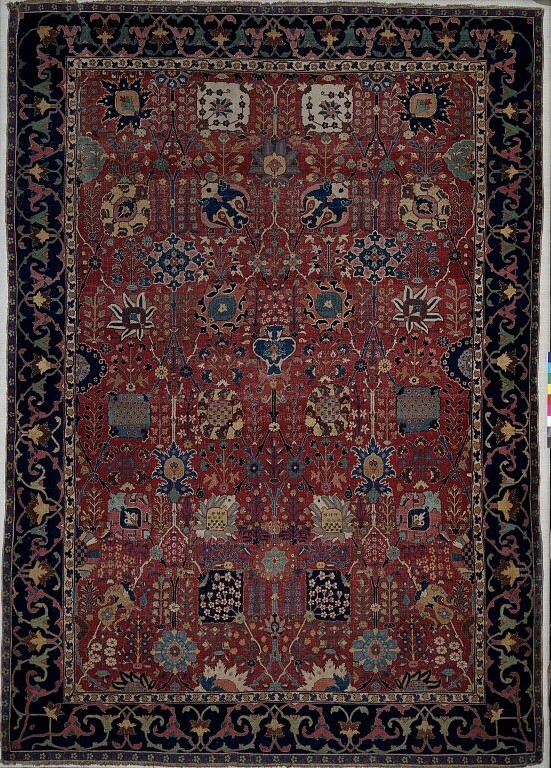 A large portion of the carpet from which these fragments came is today in the Frick Collection in New York, but it too is formed of a patchwork of fragments. The animals in this carpet have been placed in bands across the field, but this potentially rigid arrangement is not obvious because it is counter-balanced by many curving floral stems; these curves enhance the rather playful movements of the animals. 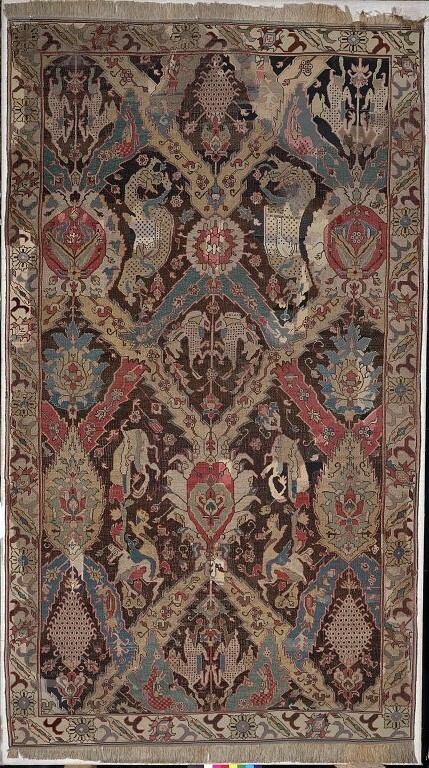 Carpet, hand knotted woollen pile on cotton warp and weft, hunting design, Indian; possibly 17th century. WARP: white cotton; Z7S; depressed; 22 threads to the inch (78 per dm). WEFT: light brown cotton; Z spun, unplied; 4 parallel threads (sometimes 3 parallel threads) per shoot, 2 shoots after each row of knots; 14 knots to the inch (55 per dm). PILE: wool; 15 colours: red, light red, yellow, light yellow, green, light green, dark blue, blue, light blue, pink, light pink, brown, light brown, black, white; asymmetrical knot open to the left and tied around 2 warp threads; 154 knots to the sq. inch (2145 per sq. dm). SIDE FINISH: both sides are missing. END FINISH: both ends are missing. DESIGN: field: red ground with a tracery of light red stems and blossoms on which are superimposed green stems bearing large, multi-coloured blossoms lying in a central row with a row of half-blossoms along each side border. Horizontally across the field are four pairs of animals; two are tigers chasing spotted deer, one is a leopard chasing an antelope and one is a lion consuming a goat. Birds perch on the green stems. Main border: dark blue ground with green foliate tracery lies beneath cream stems outlined in red that bear red flowerheads, blossoms and large composite blossoms, every other one being blue with a pale diagonal leaf on either side. Inner border: cream ground with an angular meander of, largely, blue flowers with red leaves or red flowers with blue leaves. Innermost border: yellow ground with light blue zigzag outlined in blue. Outer border: incomplete; shows a red ground with a floral meander with light red stems and leaves and predominantly pale-coloured flowers. Purchased from Messrs. Sasson & Co., 179 Wardour Street, London. 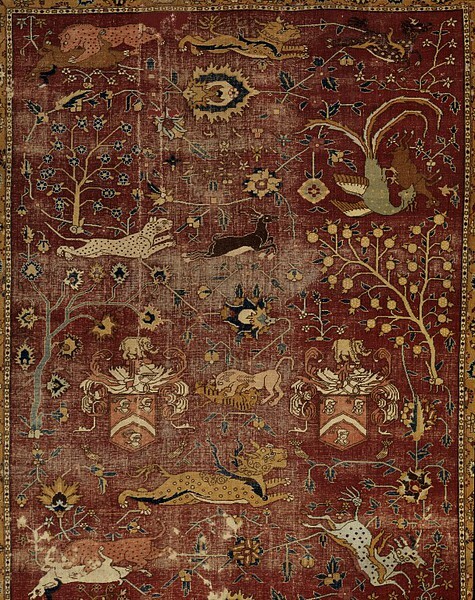 Mughal carpets with animal scenes in the field are not uncommon, but this one is unique because it has the coat-of-arms of the Fremlin family incorporated into the field and borders. It was commissioned by William Fremlin who served in India as an official of the East India Company from 1626-44, and who ended his career there as President of the Council of Surat. 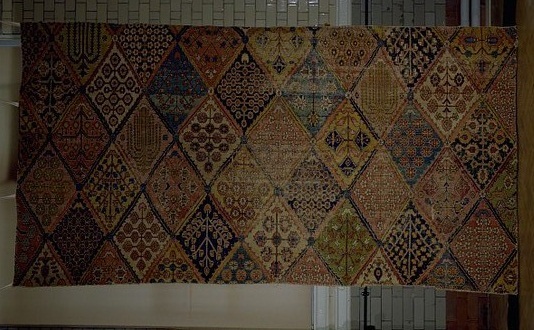 It is likely that the carpet was made towards the end of his career, probably in Lahore (today in Pakistan), which was a known centre of carpet production at the time. The Fremlin coat of arms includes an elephant as its crest, but this does not appear to be connected with William's career in India, as the arms were first granted to the family in 1567. Woollen pile carpet bearing the Fremlin coat-of-arms. The ground is red with a deep blue border. The pattern consists of floral, animal and bird motives interspersed with the coat-of-arms both in the main field and in the border. Cotton warp and weft. Sehna knotting with three shots of weft between each line of knots. About 224 knots per square inch (16 knots per warp inch; 14 knots per weft inch). Warp Z6S (or in some places Z5S), weft Z3S. In colours of white, red, blue, brown, green and yellow. The Fremlin carpet which probably served as a table cover, was made for William Fremlin, a servant of the East India Company between 1626 and 1644. and was probably made for him after 1637, when he became President of the Council at Surat. The family coat-of-arms appears both in the main field and in the border. Swallow, Deborah and John Guy eds. Arts of India: 1550-1900. text by Rosemary Crill, John Guy, Veronica Murphy, Susan Stronge and Deborah Swallow. London : V&A Publications, 1990. 240 p., ill. ISBN 1851770224, p.157, pl.132.